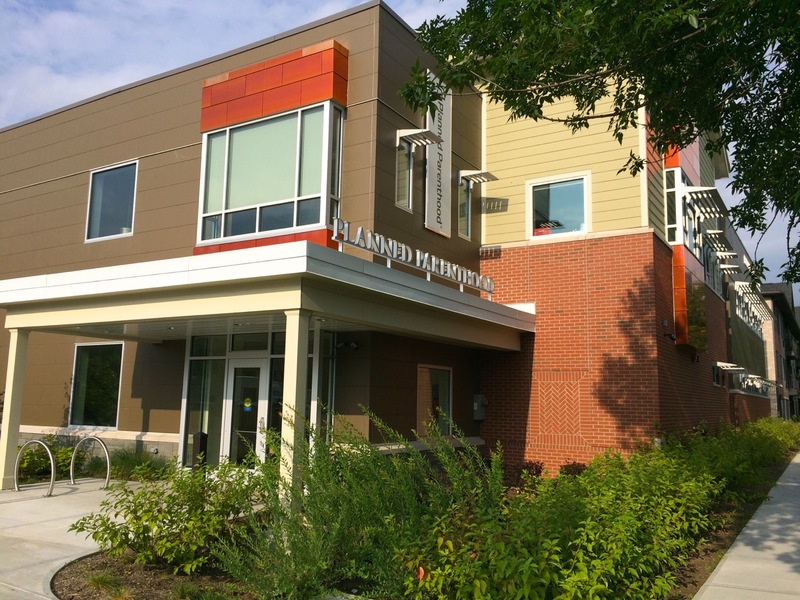 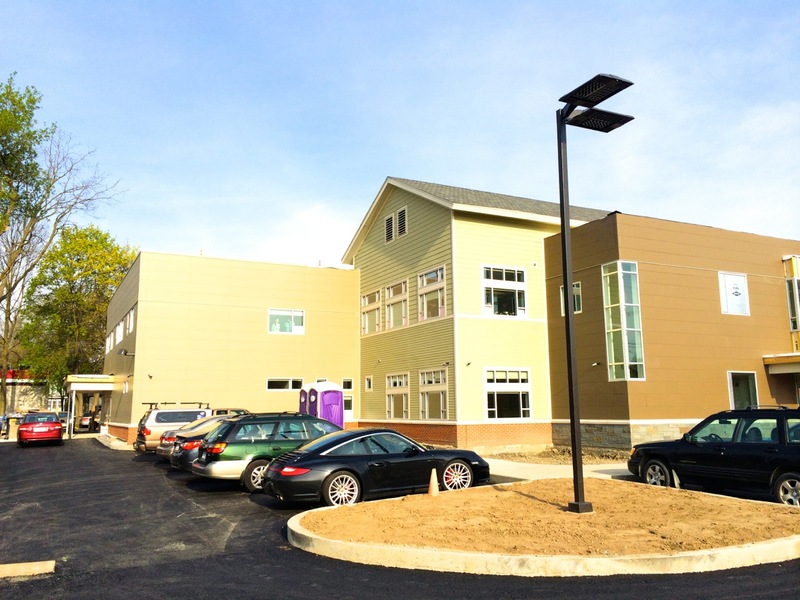 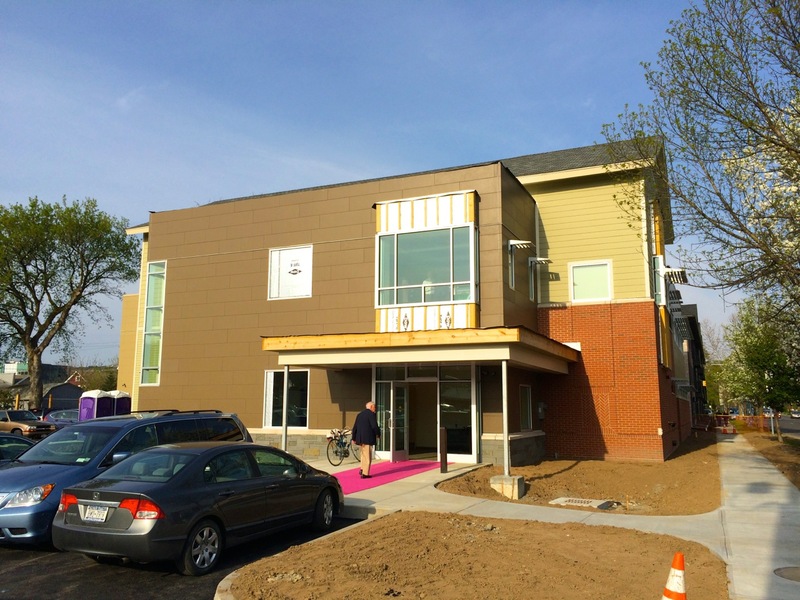 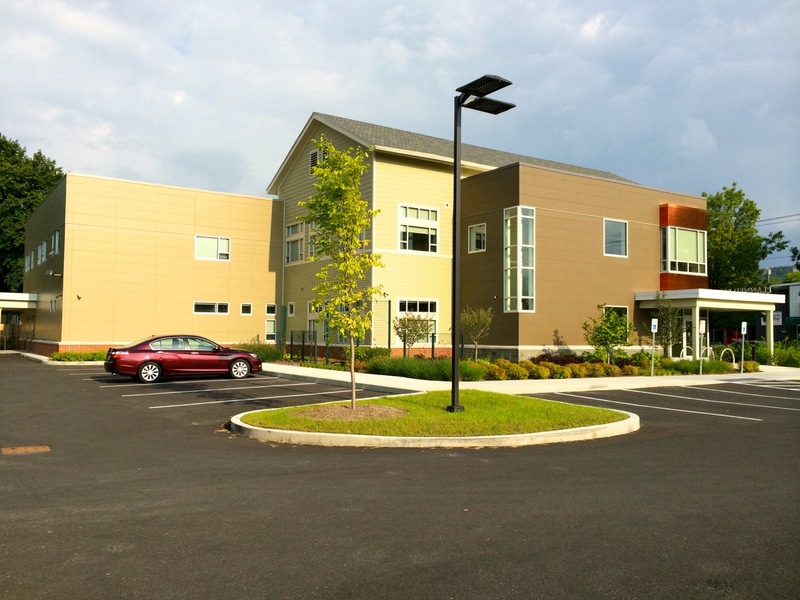 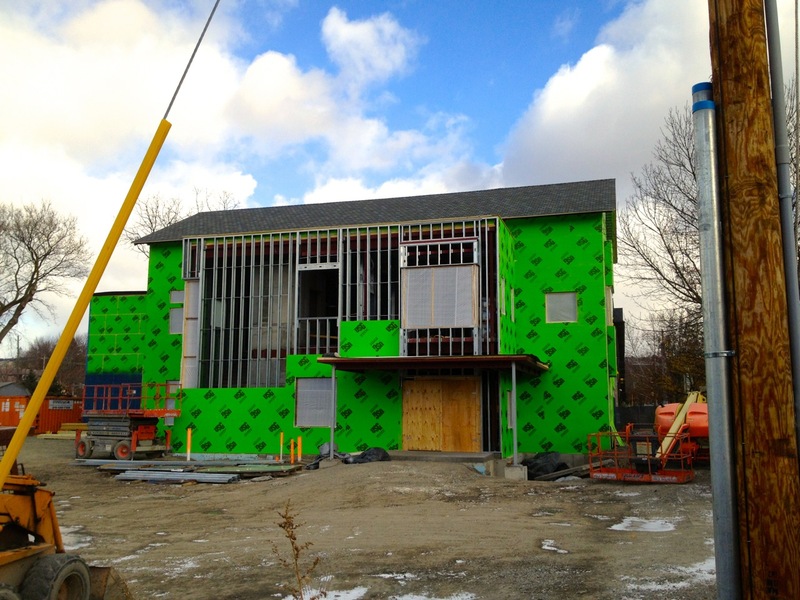 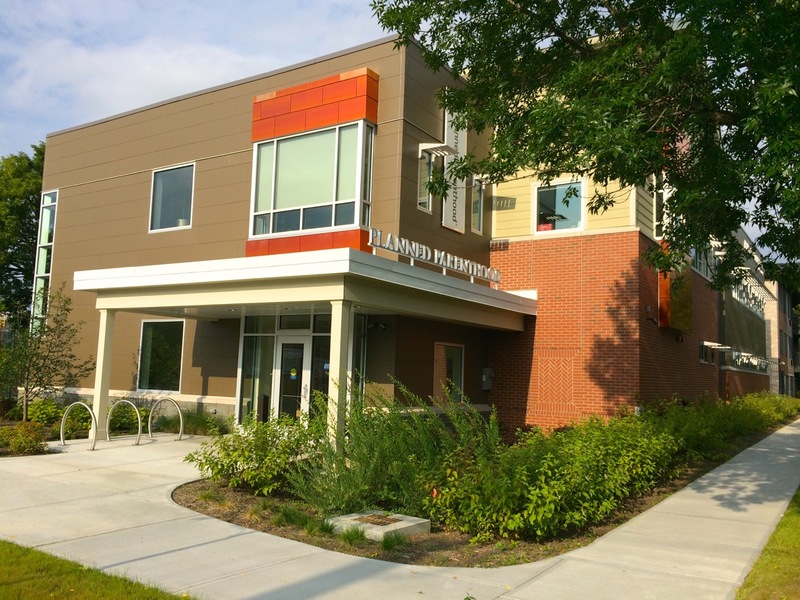 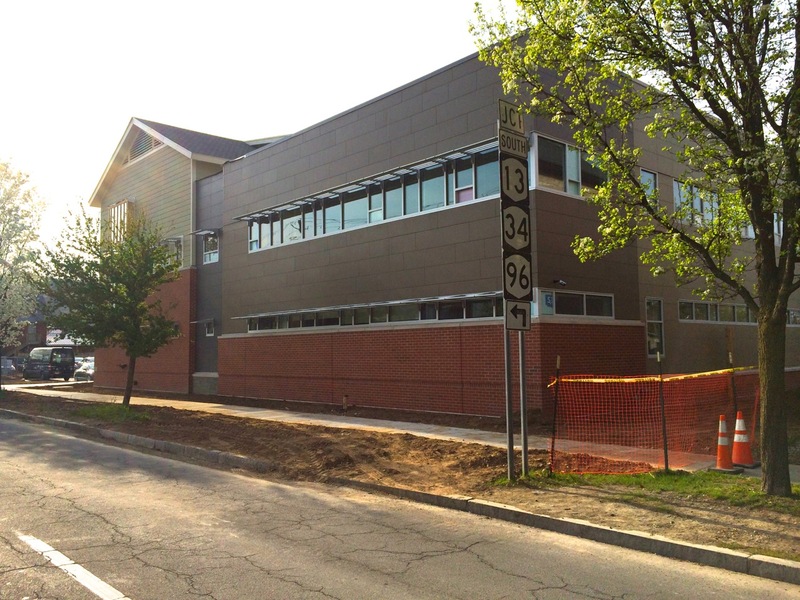 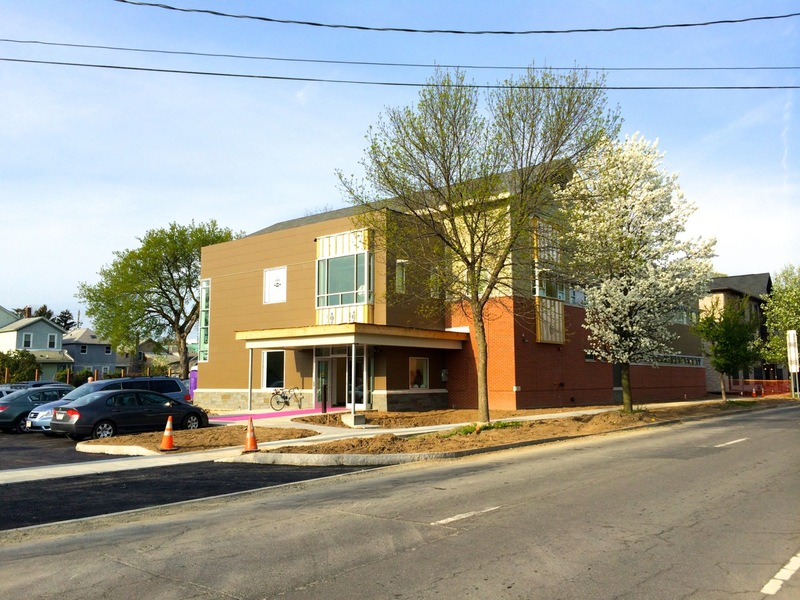 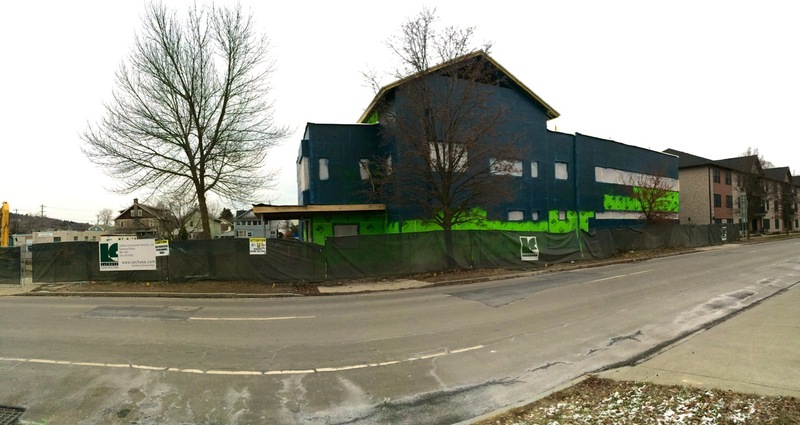 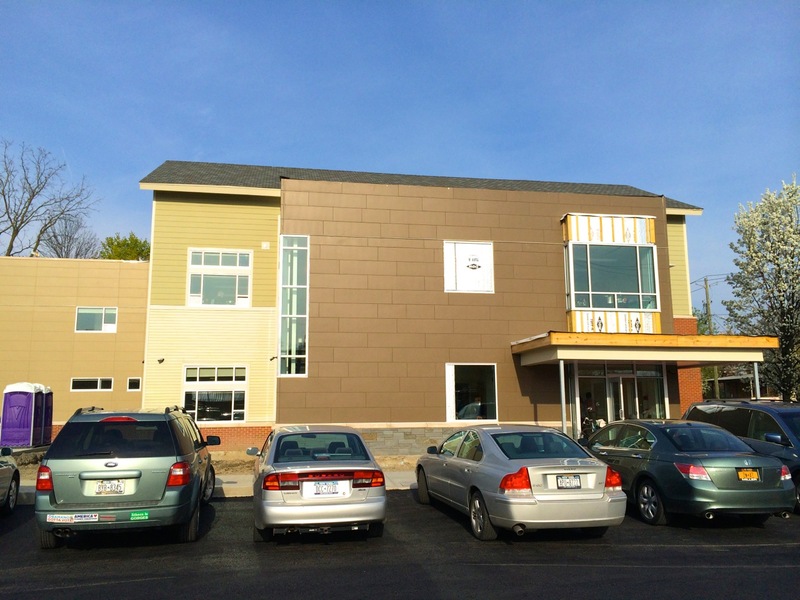 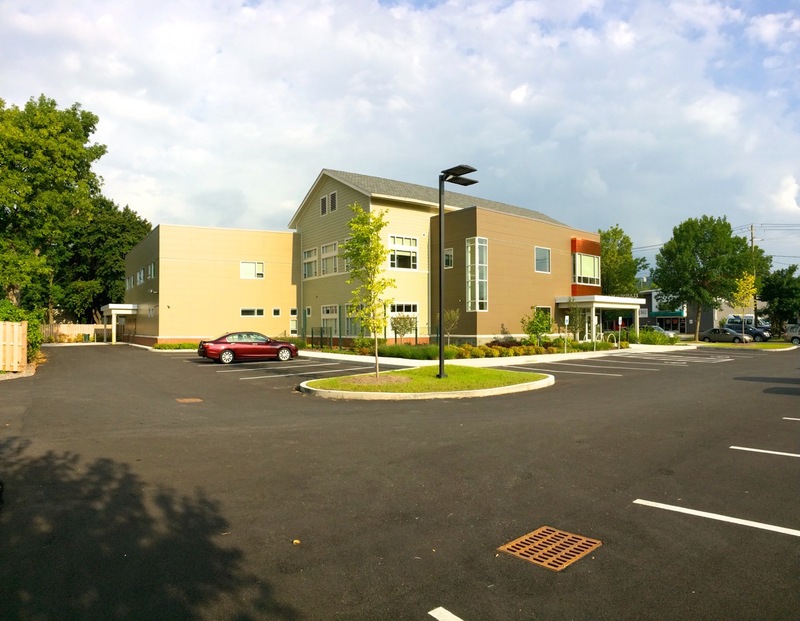 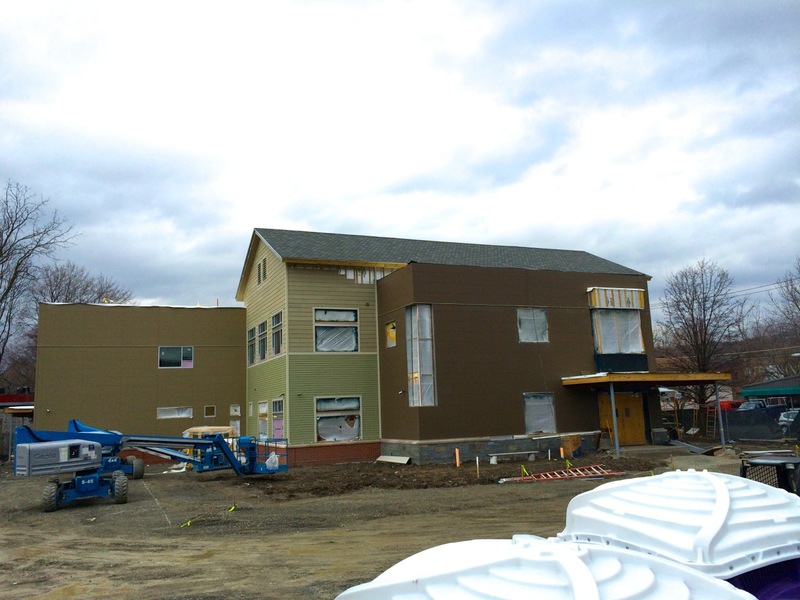 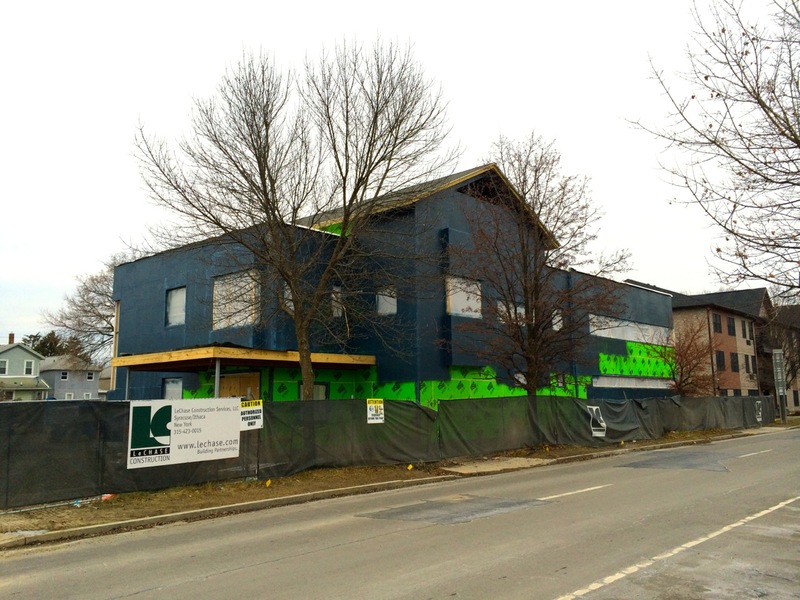 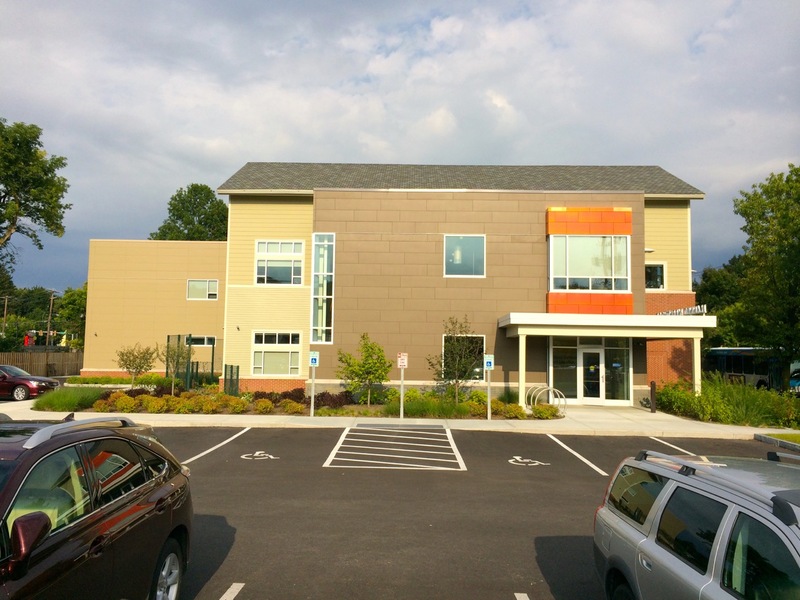 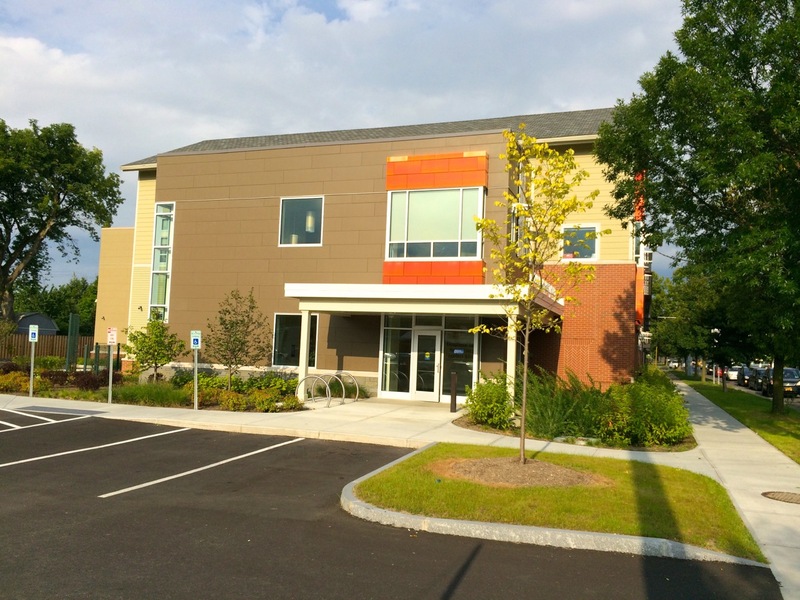 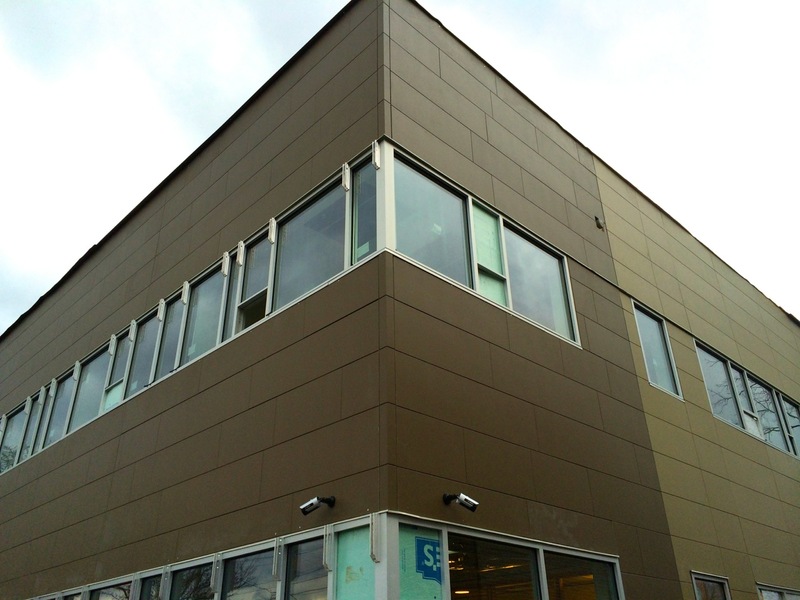 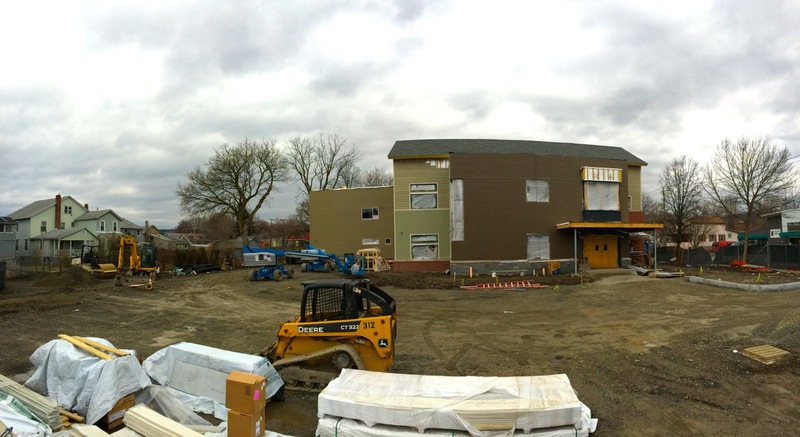 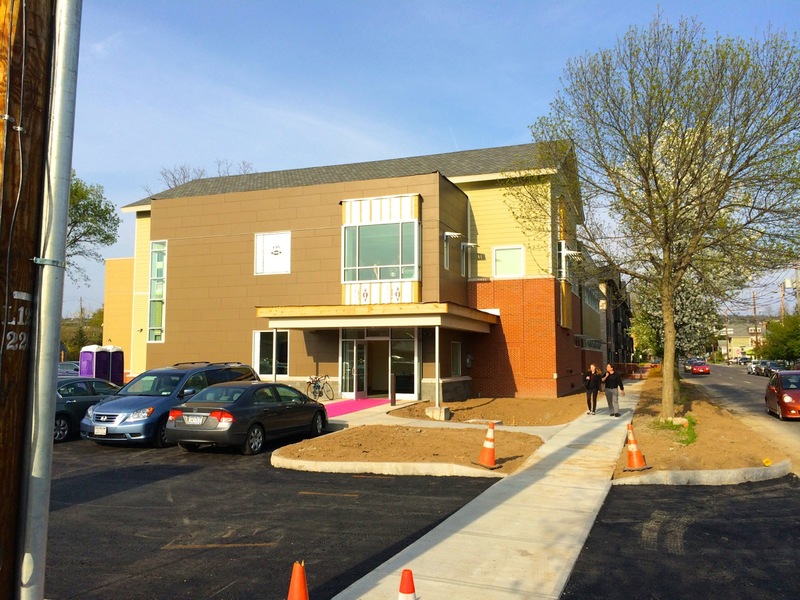 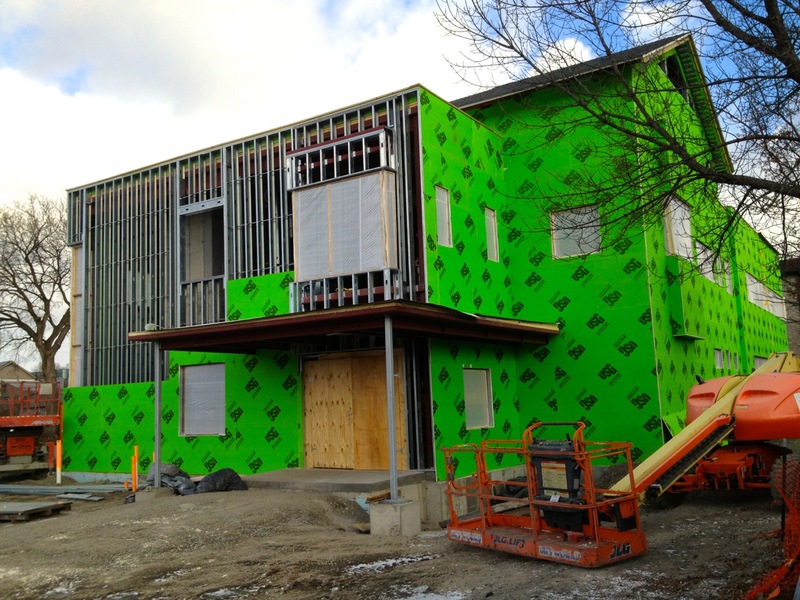 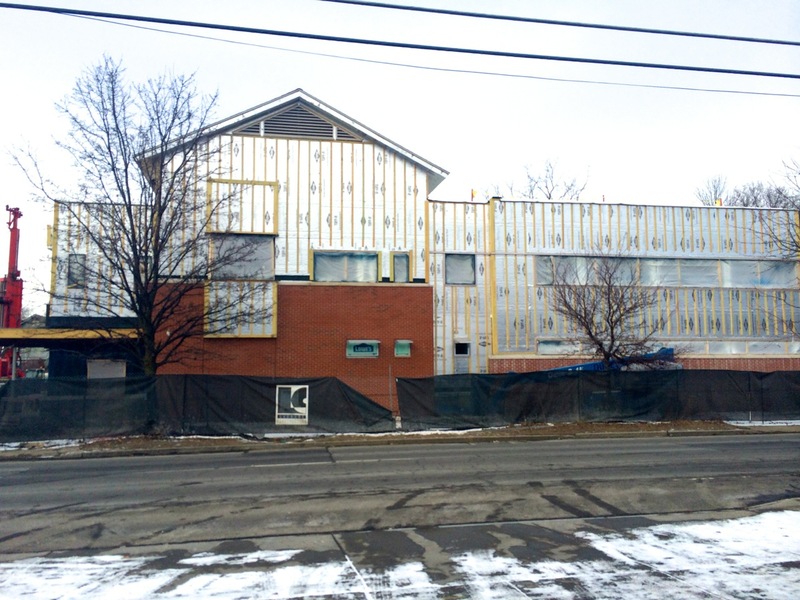 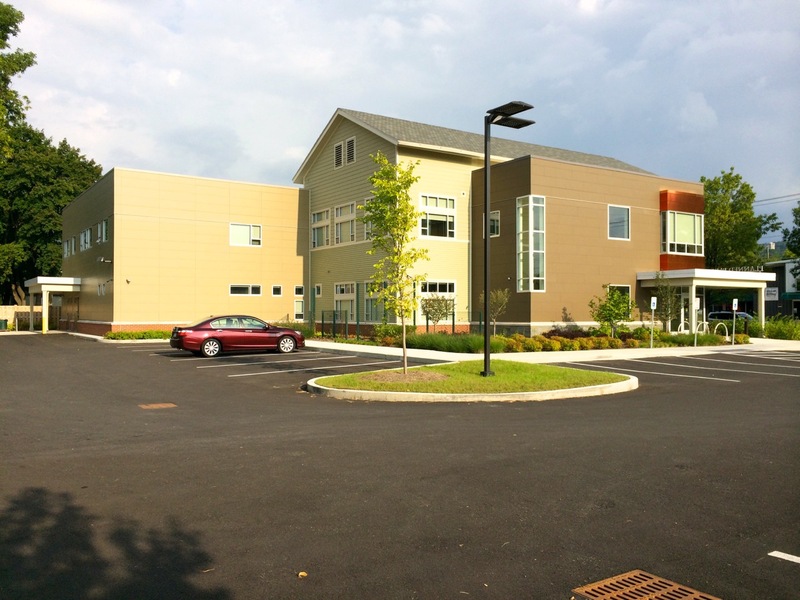 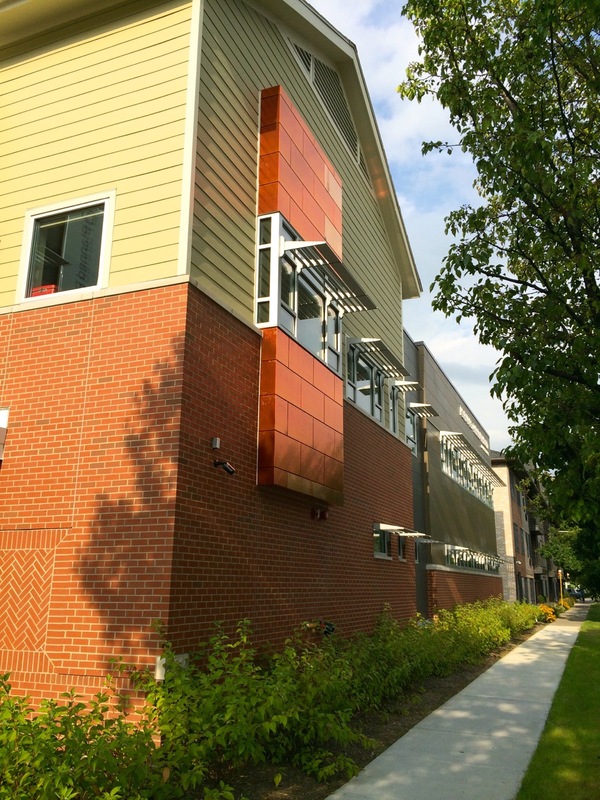 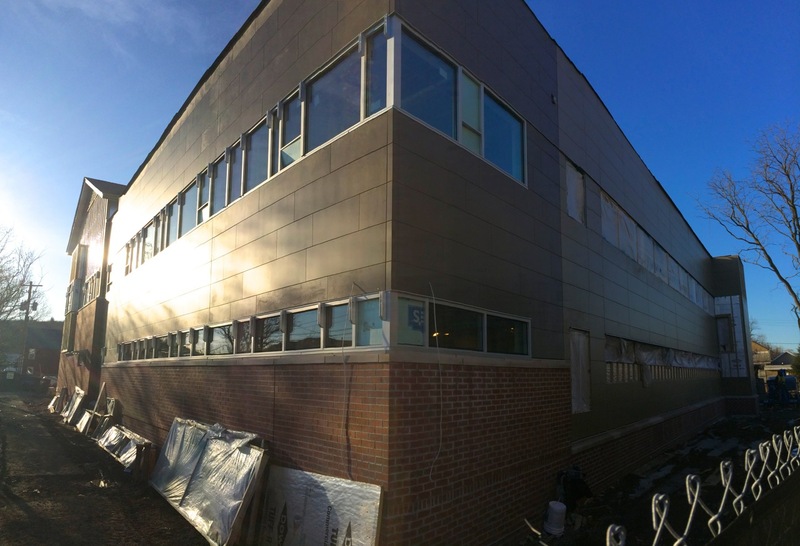 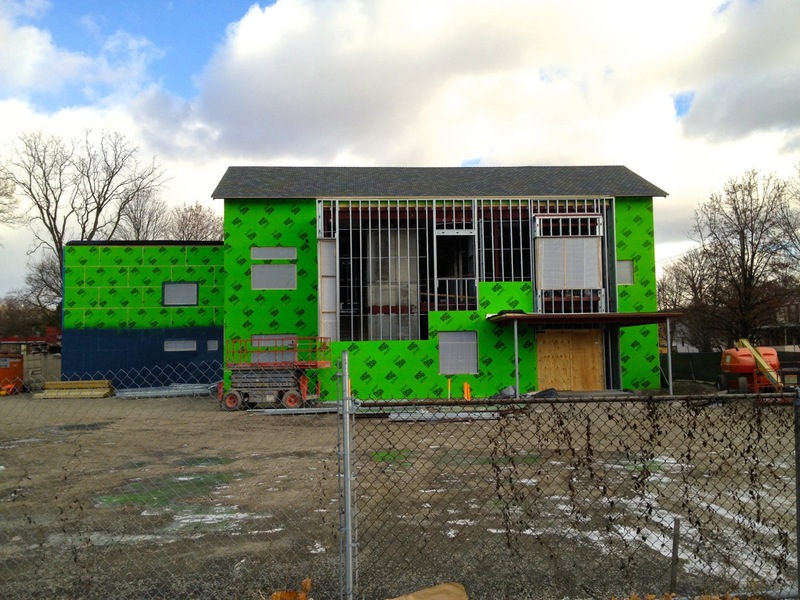 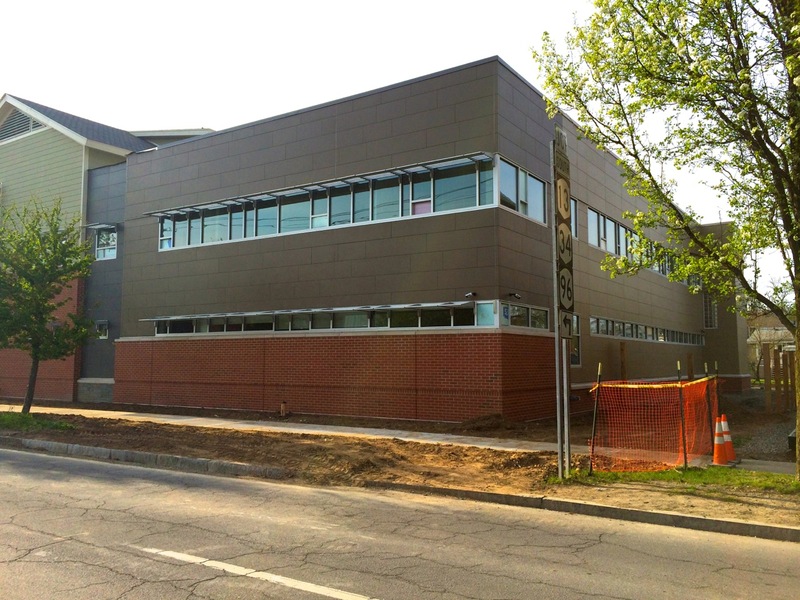 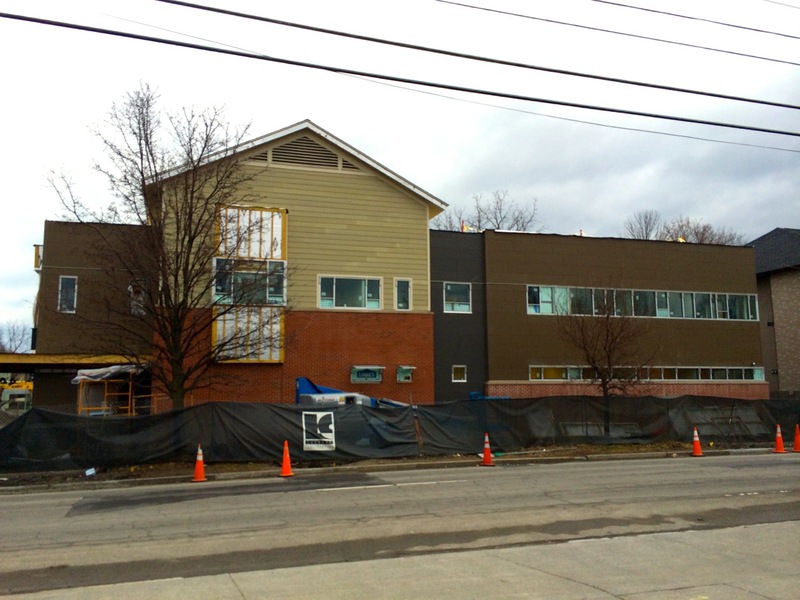 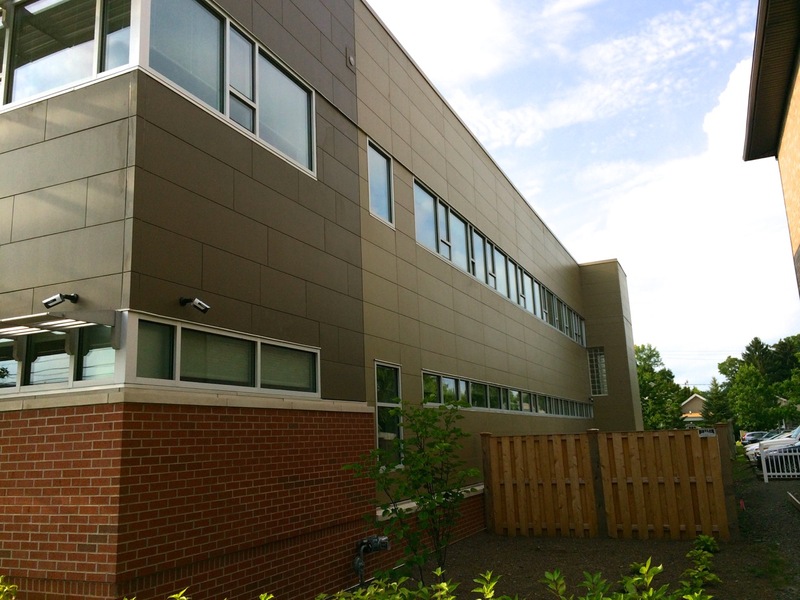 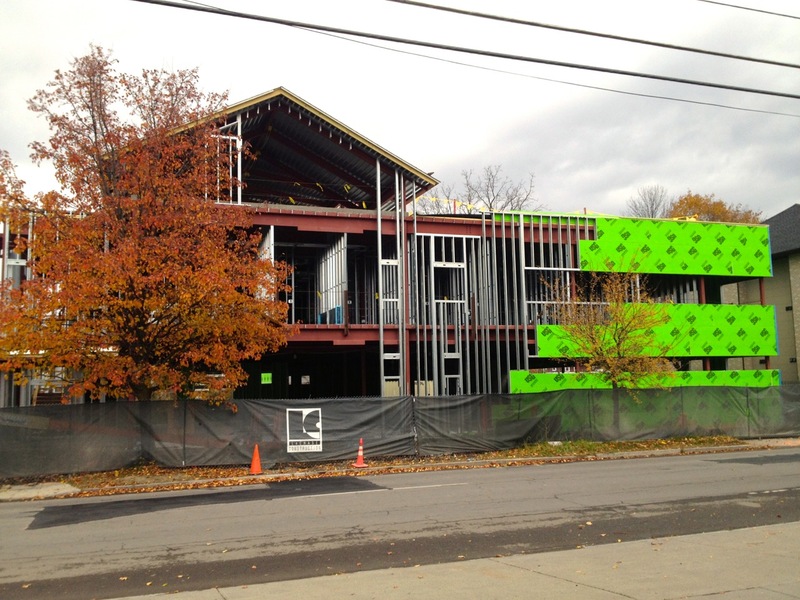 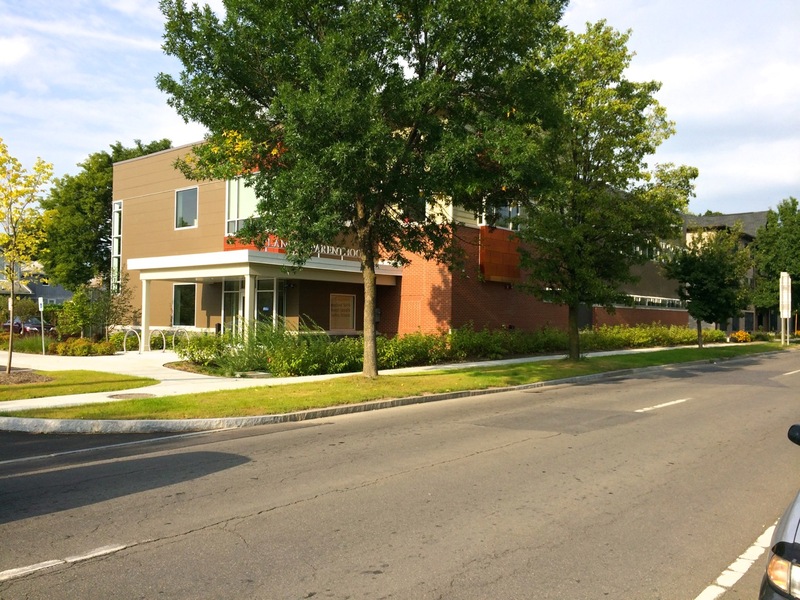 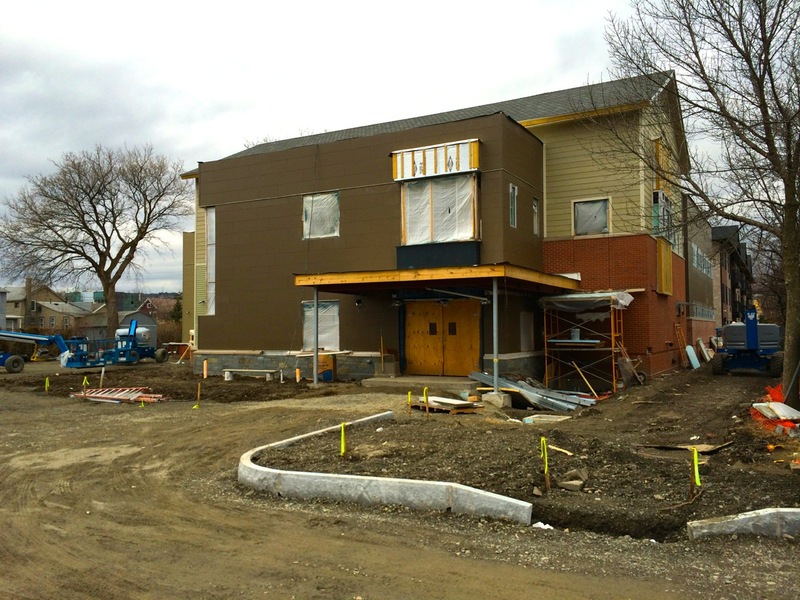 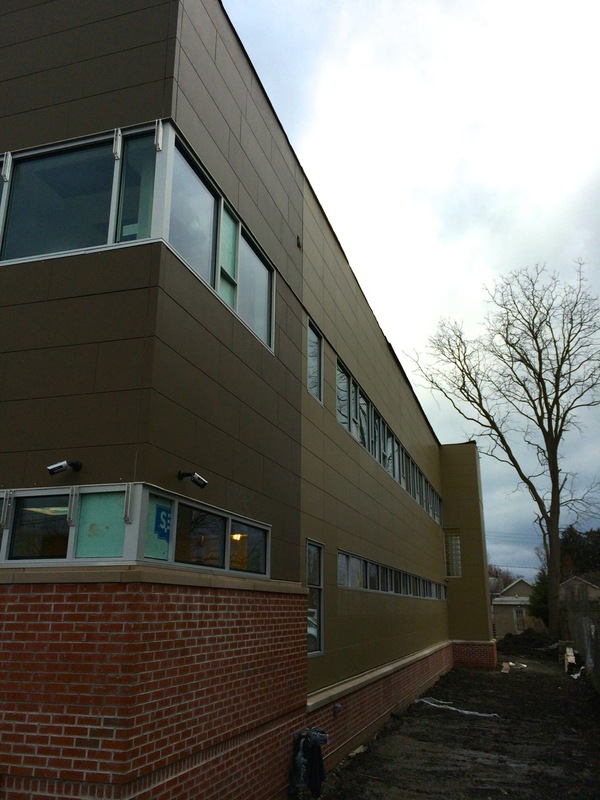 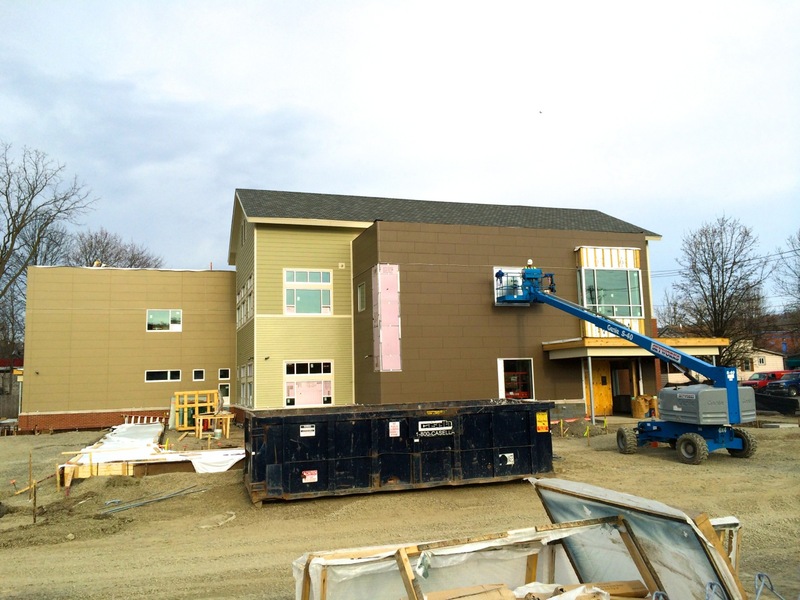 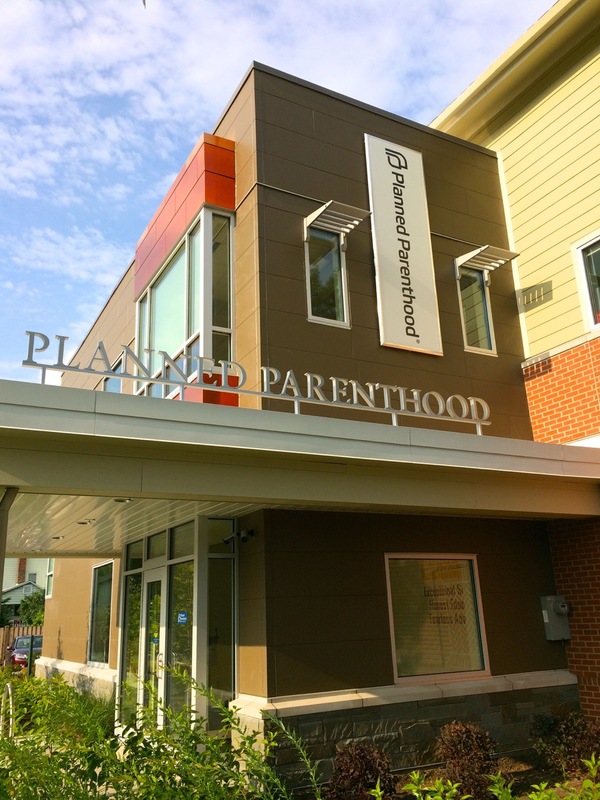 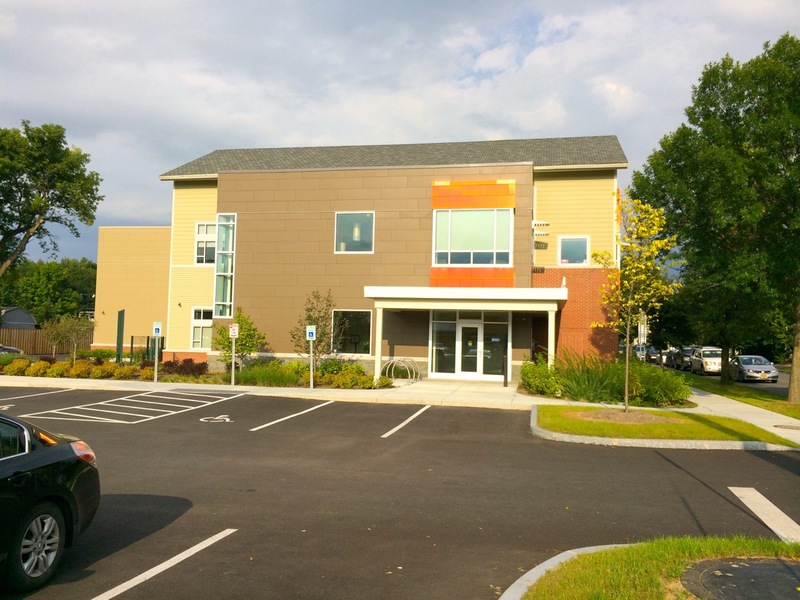 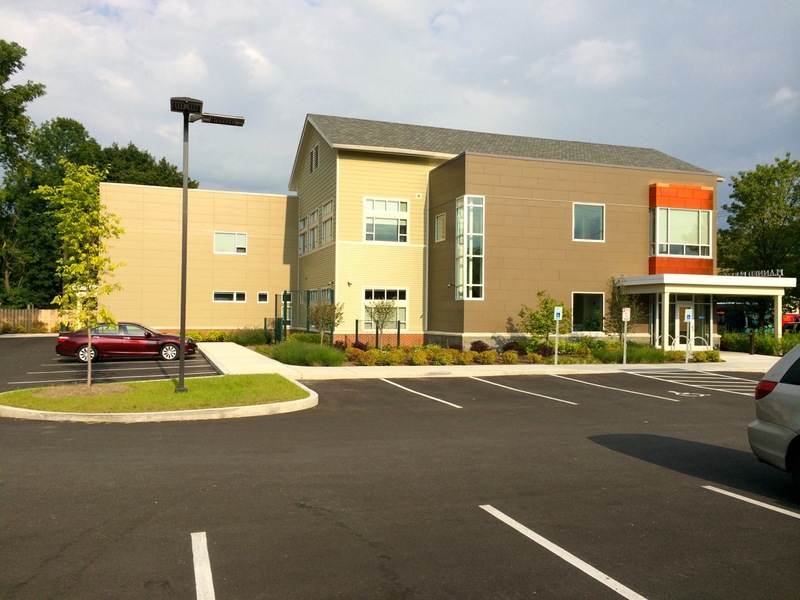 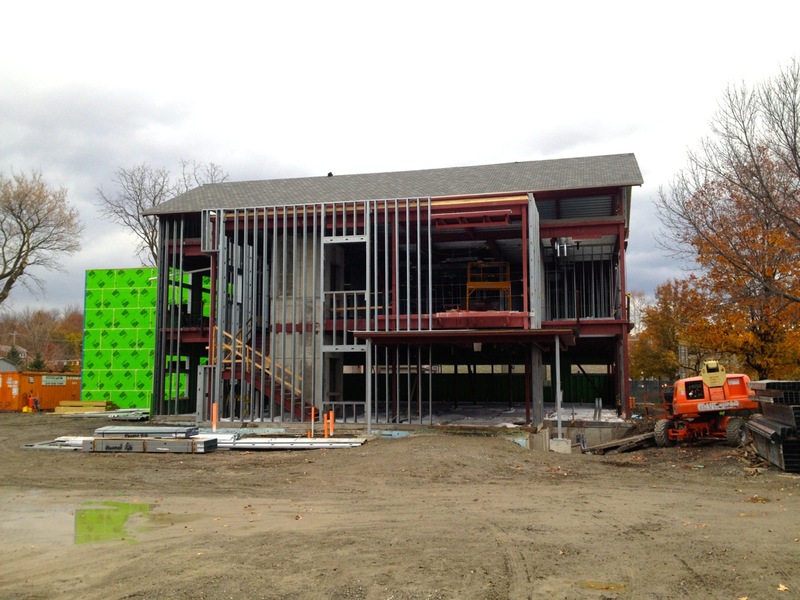 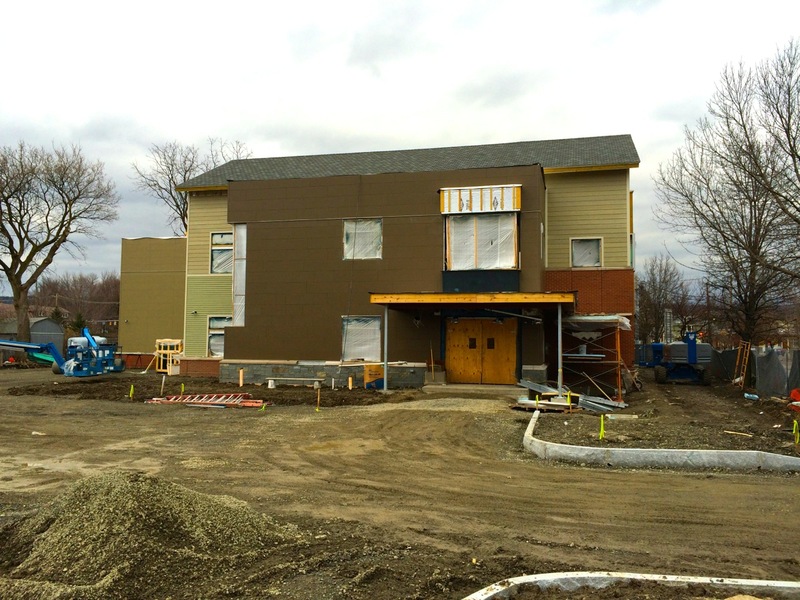 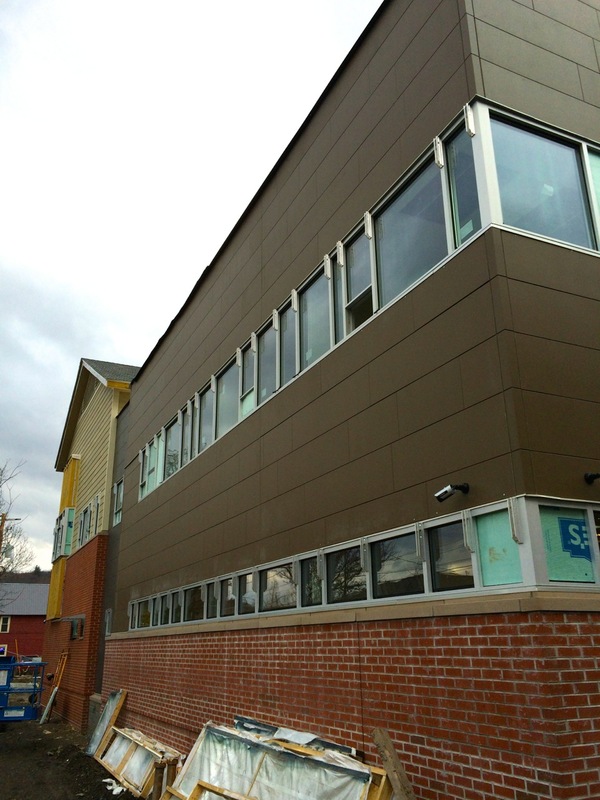 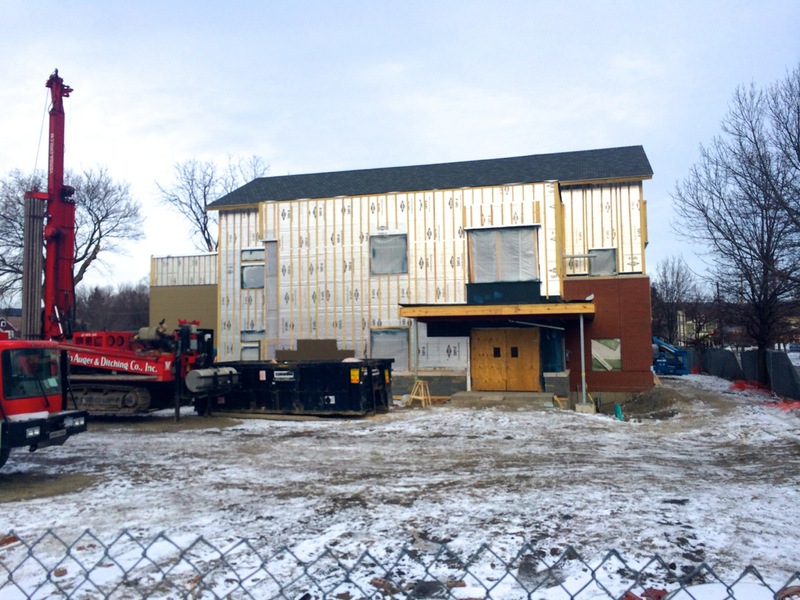 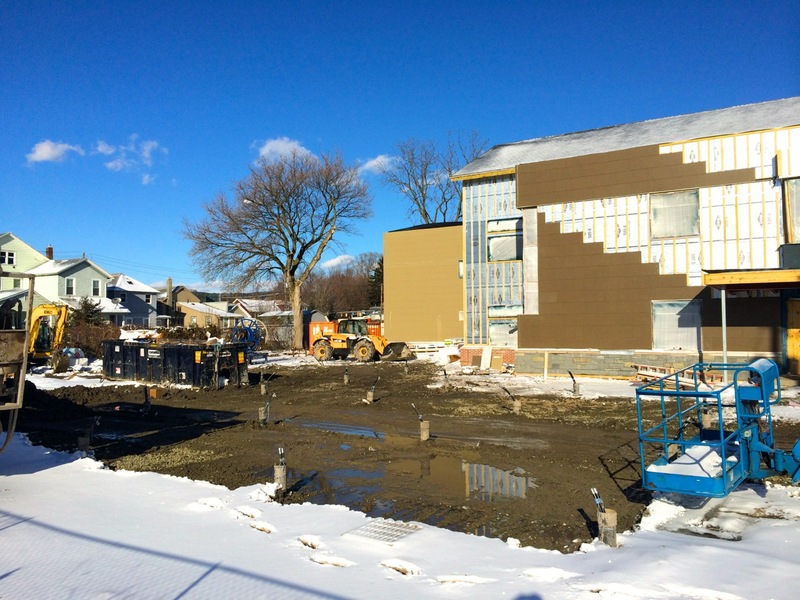 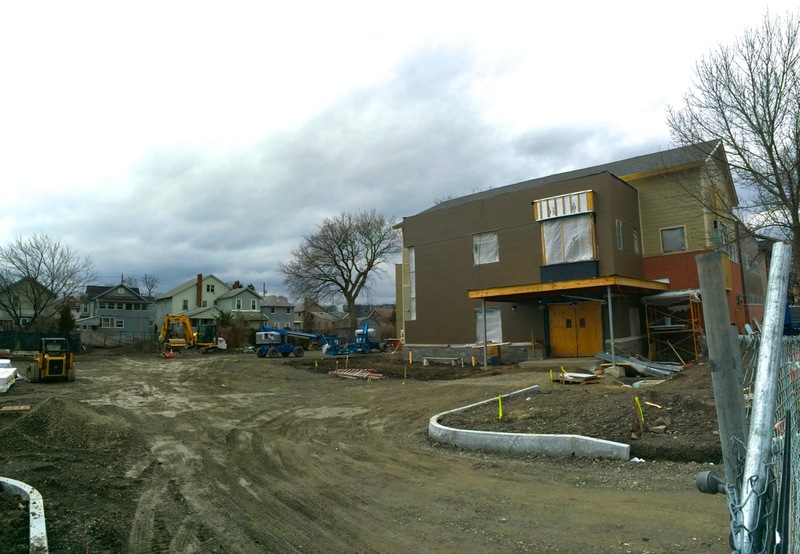 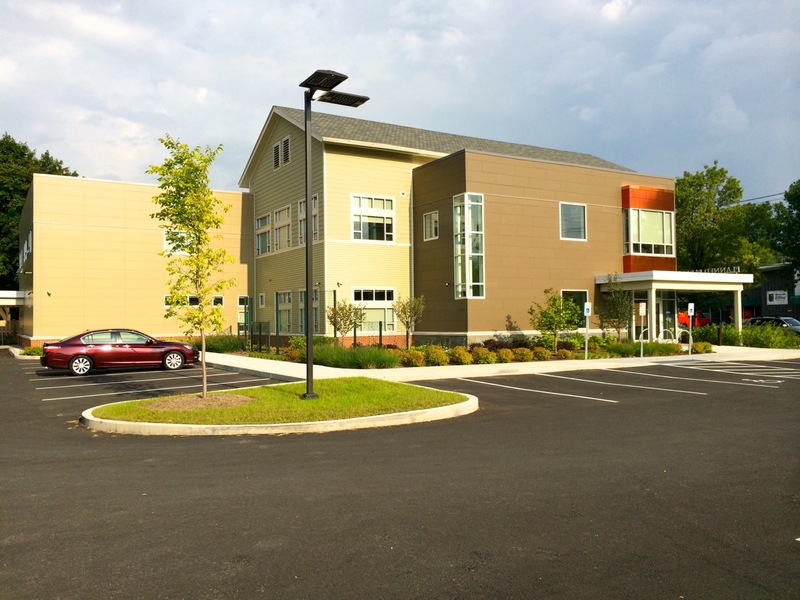 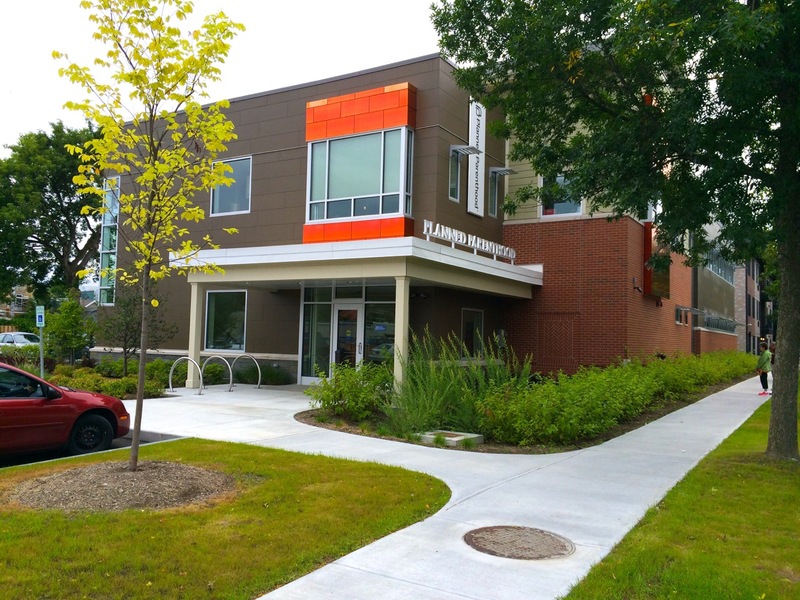 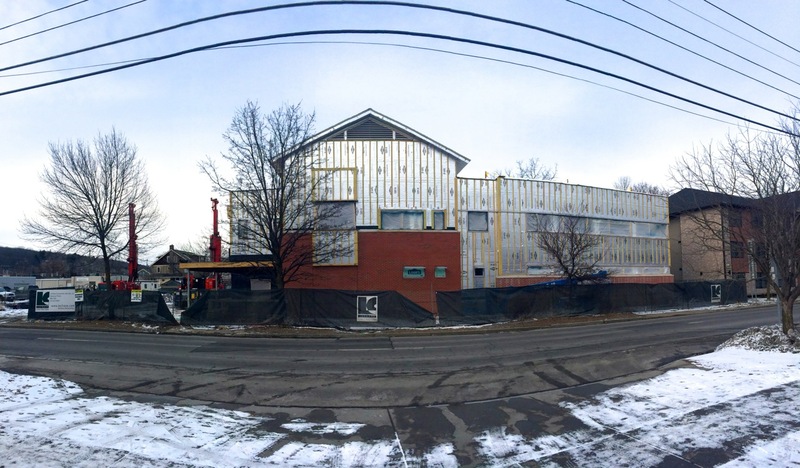 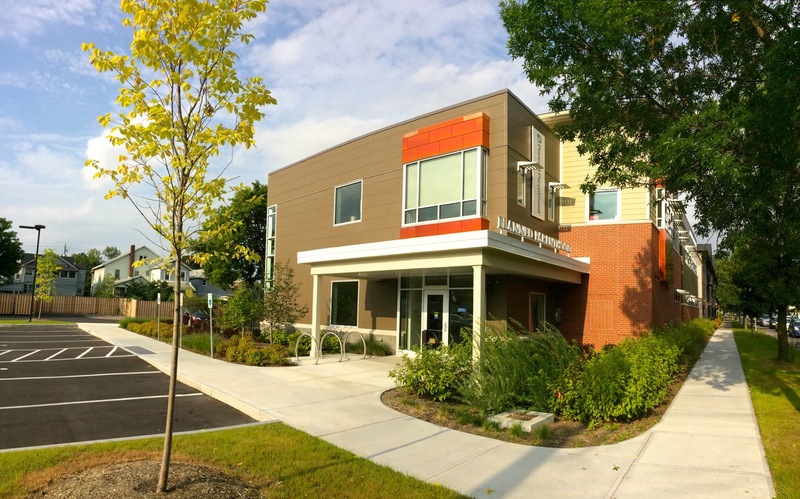 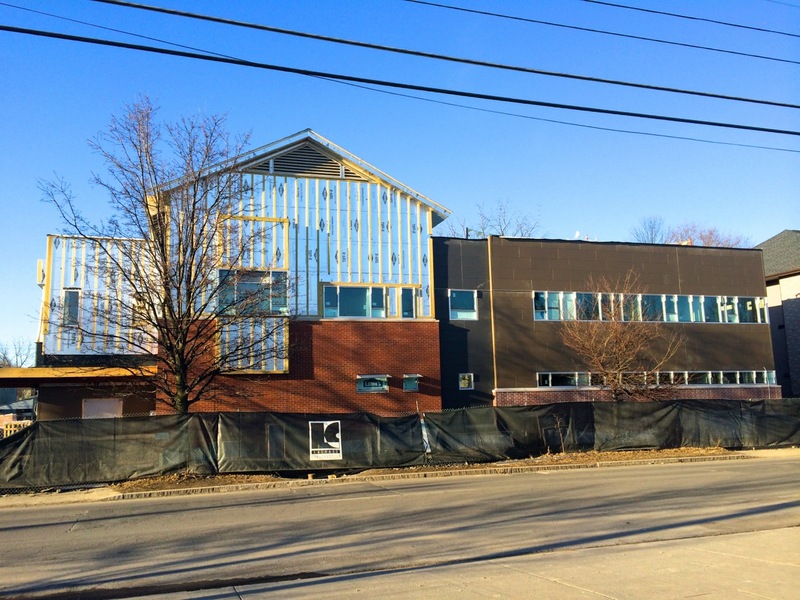 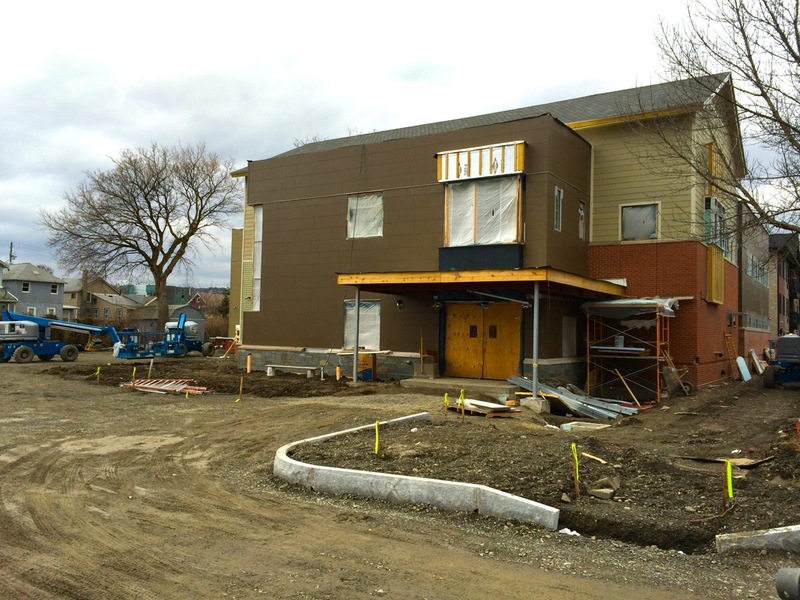 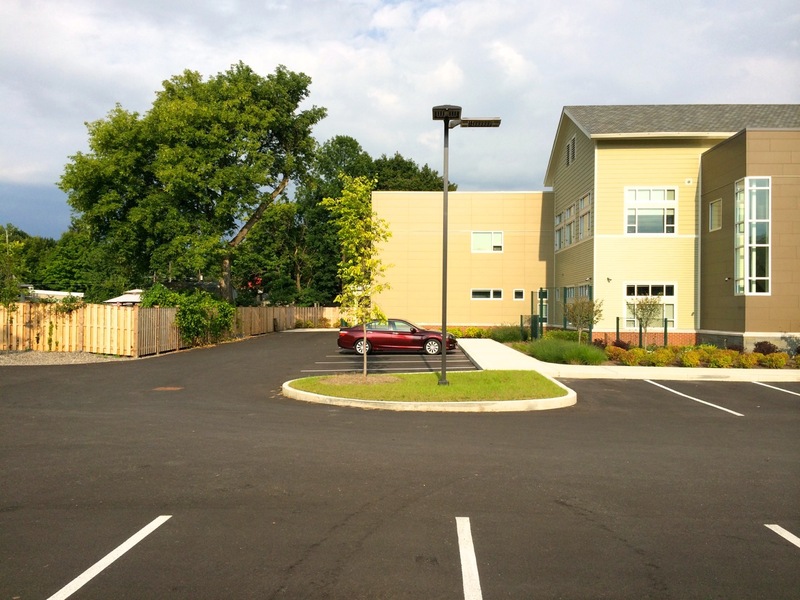 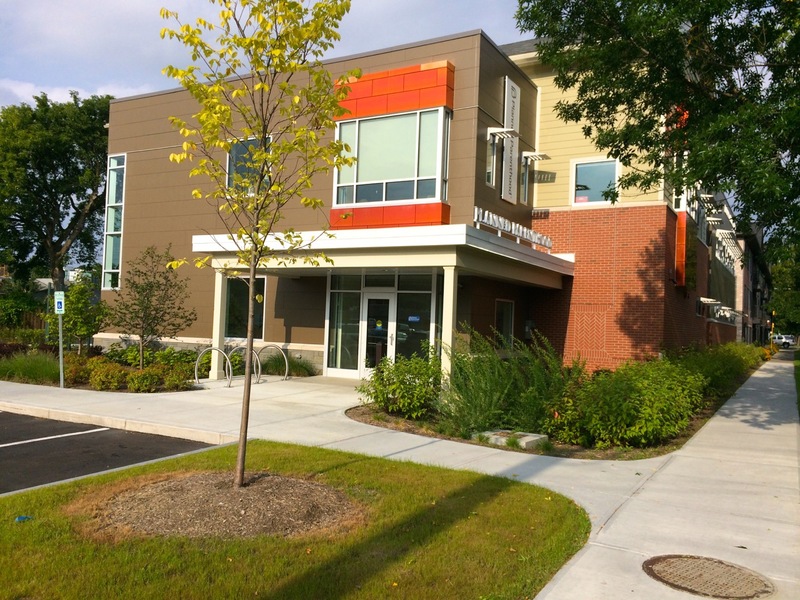 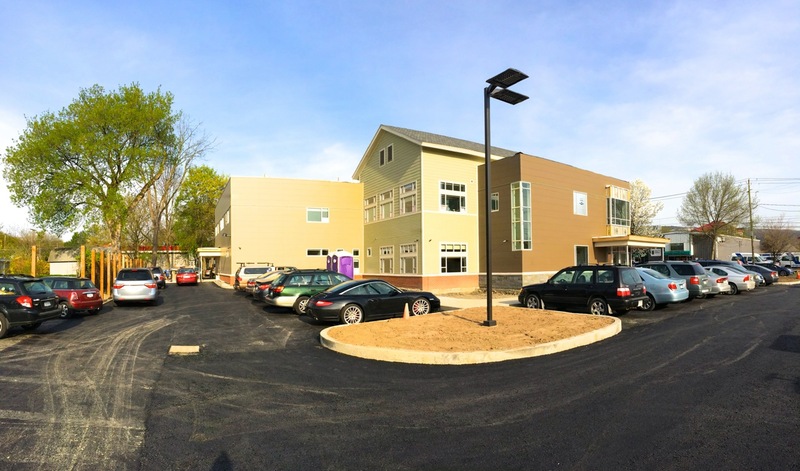 Photos of this Planned Parenthood of the Southern Finger Lakes project taken last week, but exterior siding and fiber-cement facade panel installation look complete, as well as recently-placed granite curbing along the drive entry and Seneca Street. 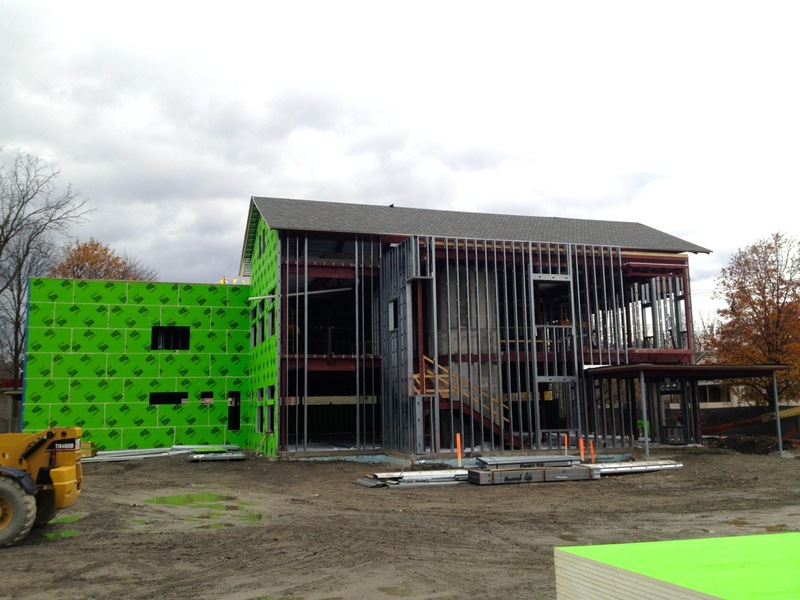 It’s hard to tell from the outside, but it looks as if the walls are all framed, and electric, plumbing, and mechanicals are roughed-in, but finish-work like drop ceiling grids and drywall are continuing. 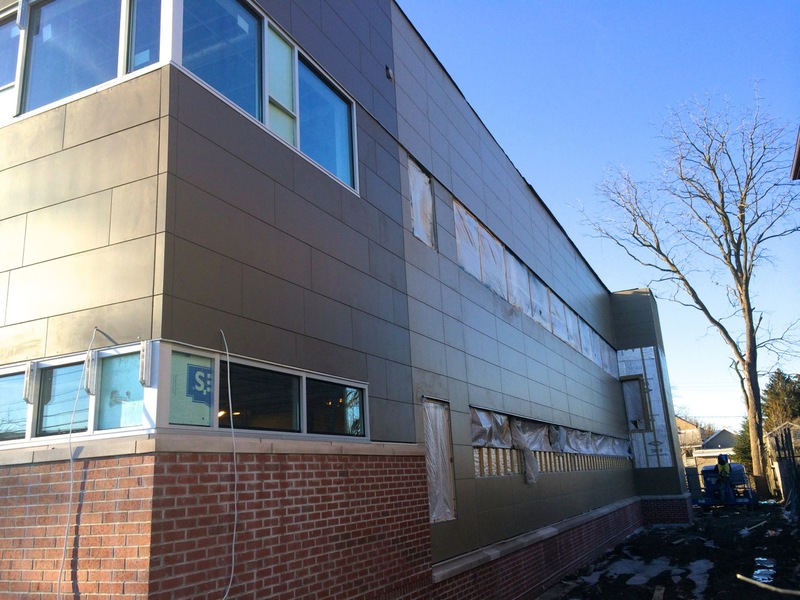 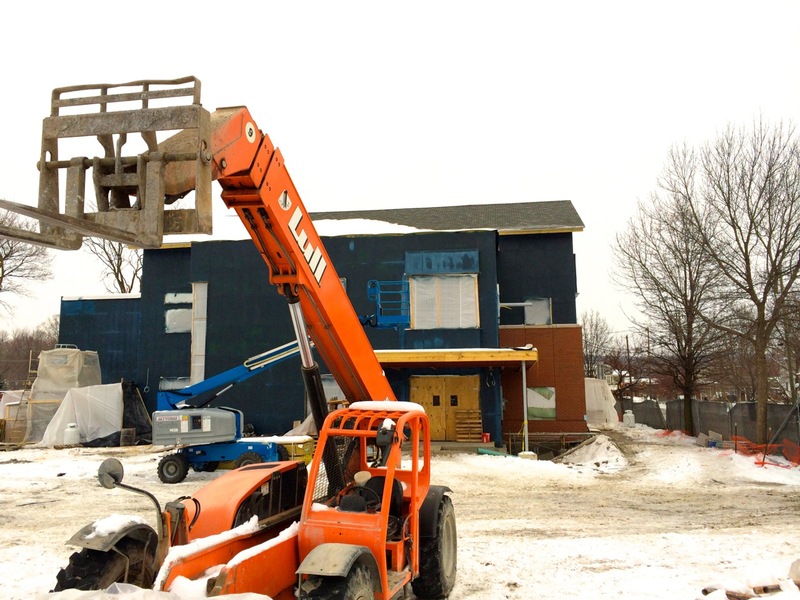 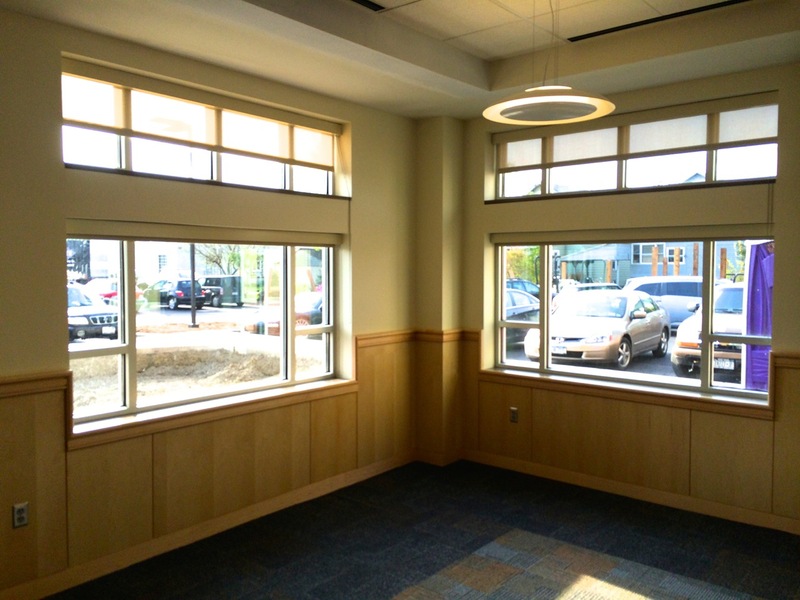 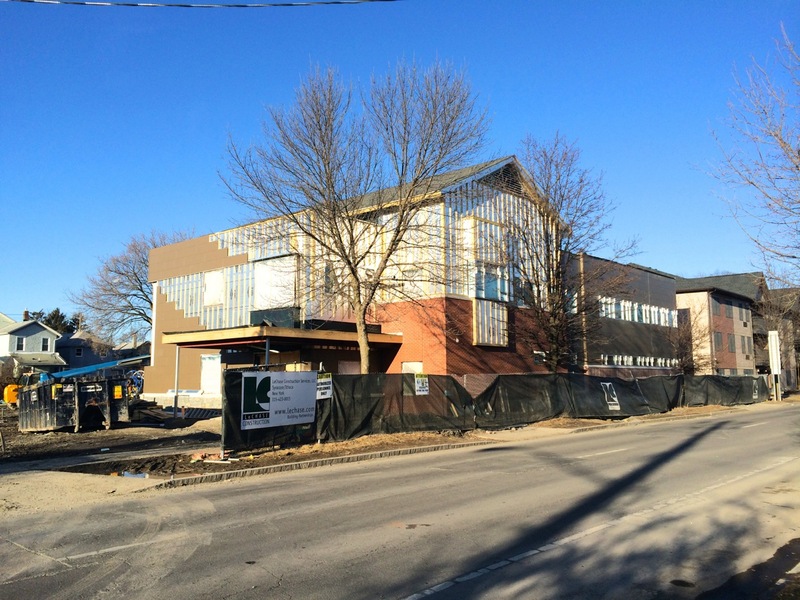 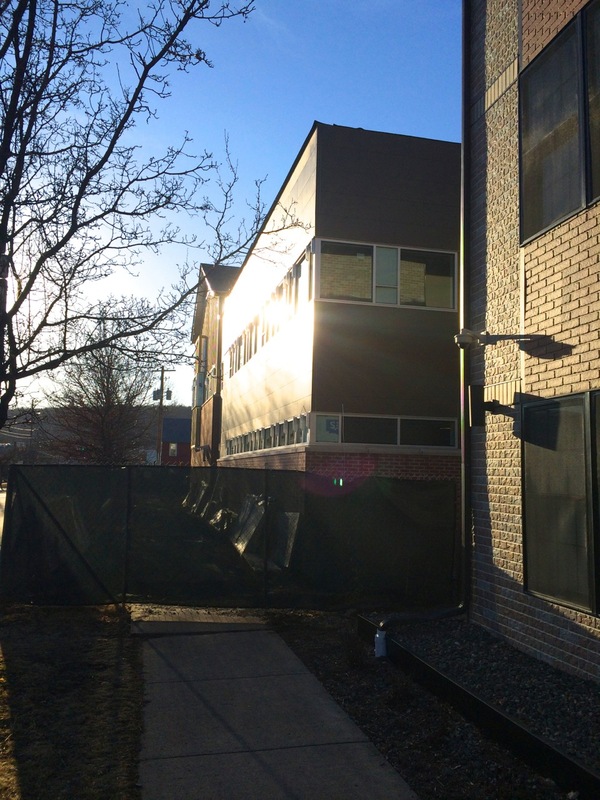 Once the remaining windows, shades, signage, doors, lighting fixtures, and roofing fascia boards are installed, the building itself should look relatively complete on the outside. 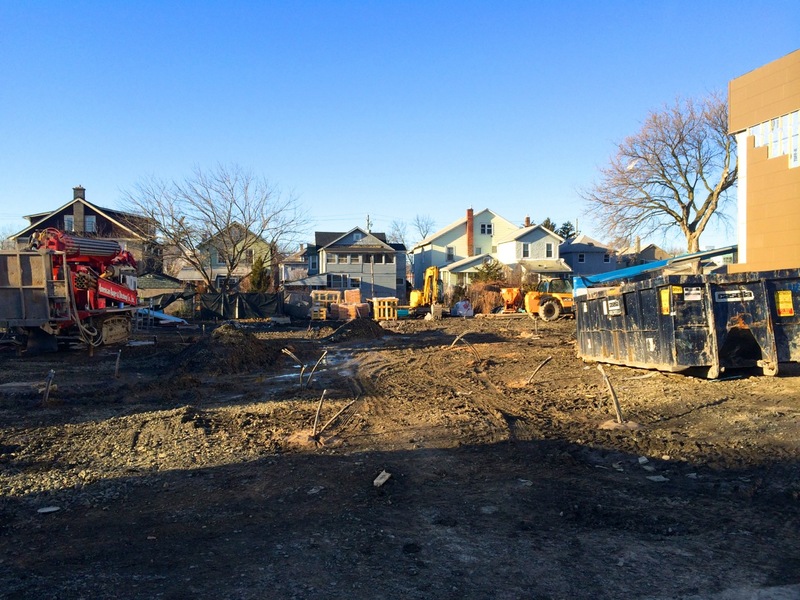 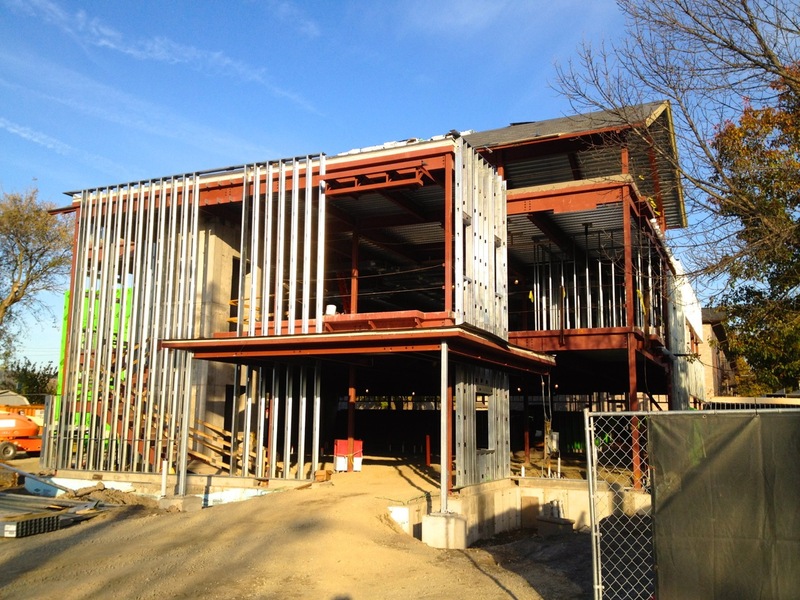 This project is being constructed by LeChase Construction, and is designed by Chiang O’Brien Architects. 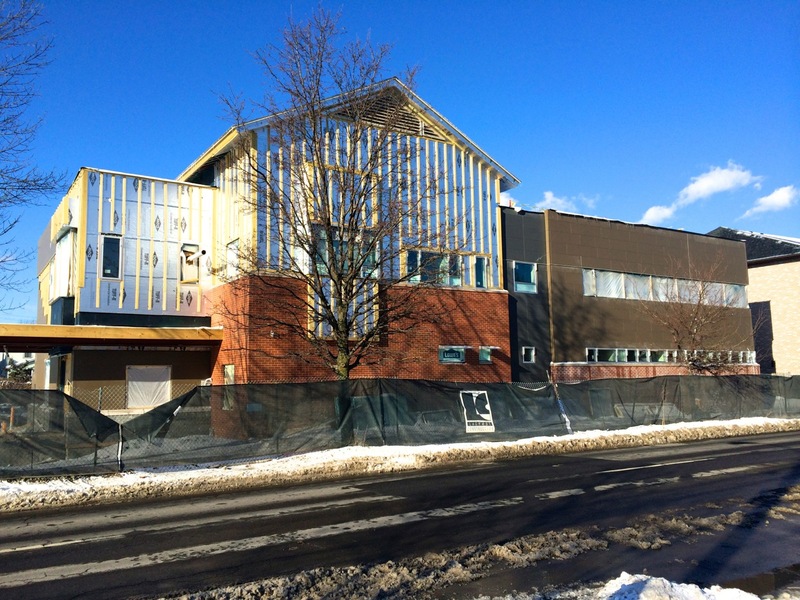 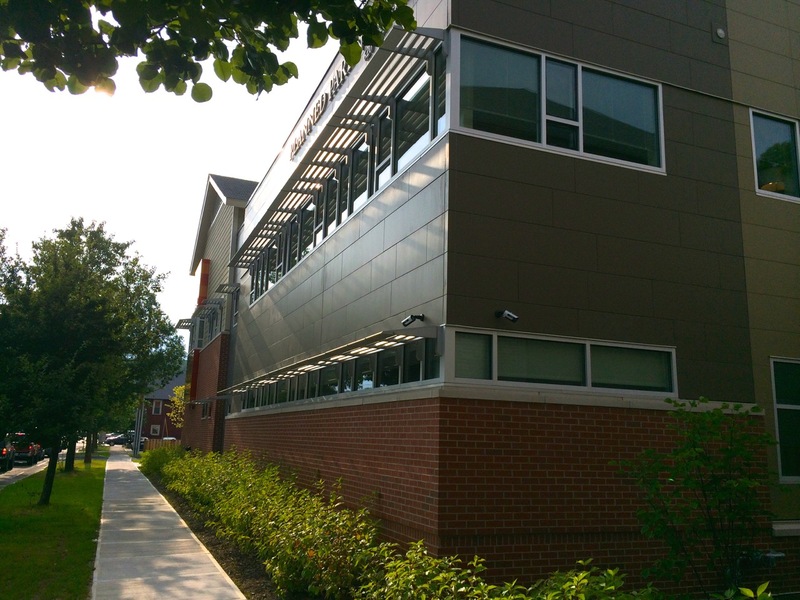 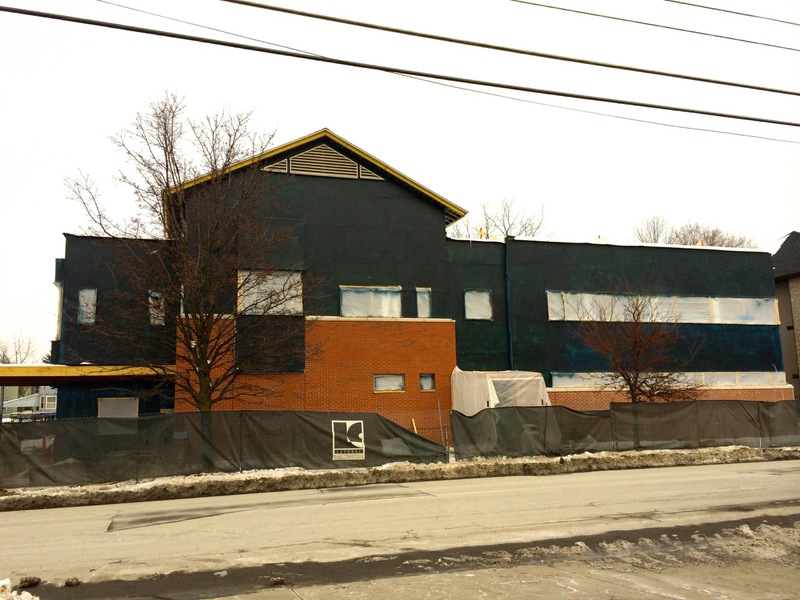 Sections of the Planned Parenthood (of the Southern Finger Lakes) Ithaca project’s facade have been filled-in with brick as called for in the design by Chiang O’Brien Architects. 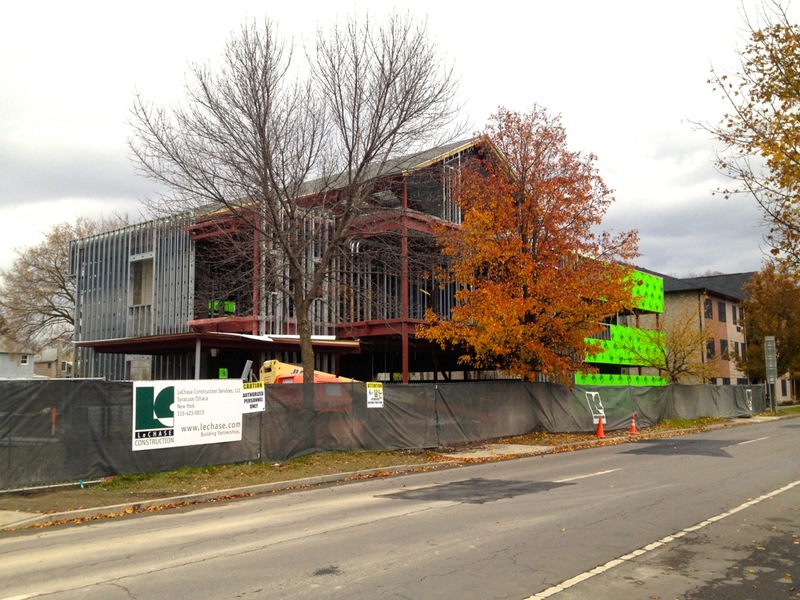 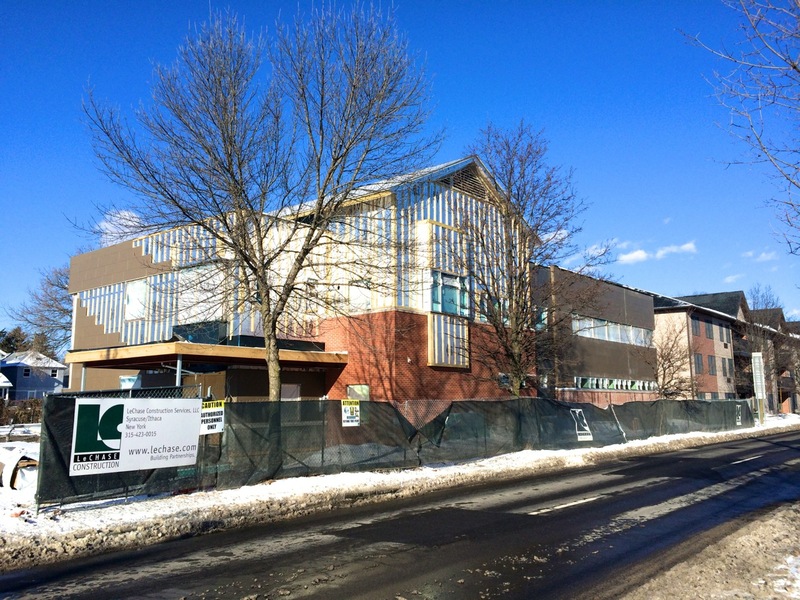 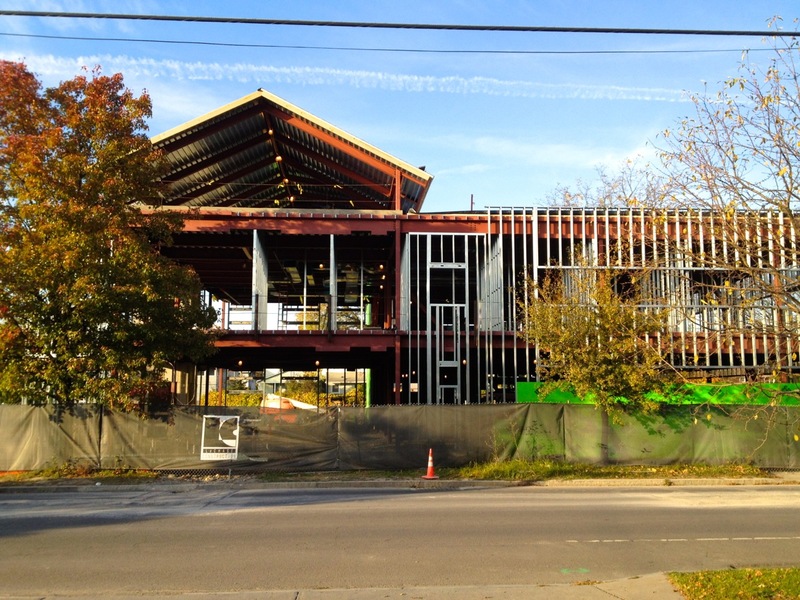 The majority of the work is moving along in the 16,000 square foot interior, which was closed-up by early December, along with the sealing of the bright green glass-mat sheathing covering over the exterior stud walls. 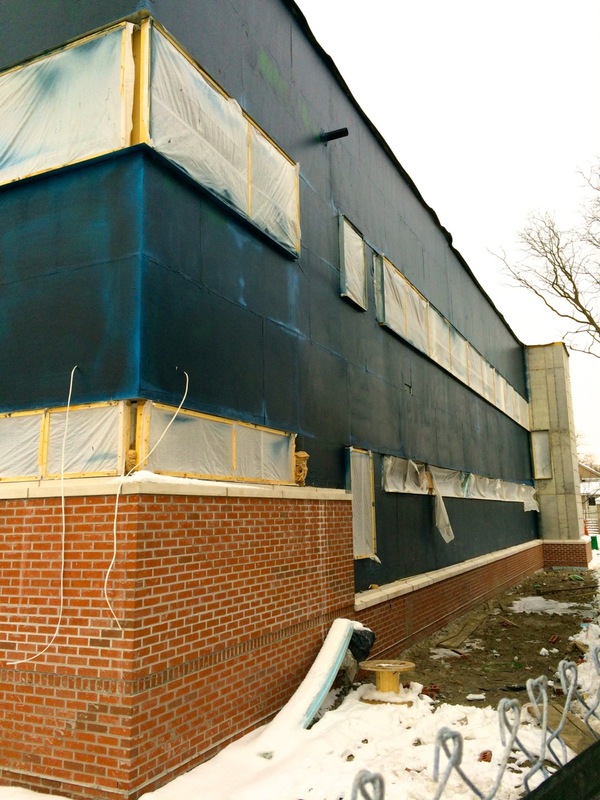 Besides brick, much of the building will be covered with various styles of fiber cement panels, as shown in the plans below. 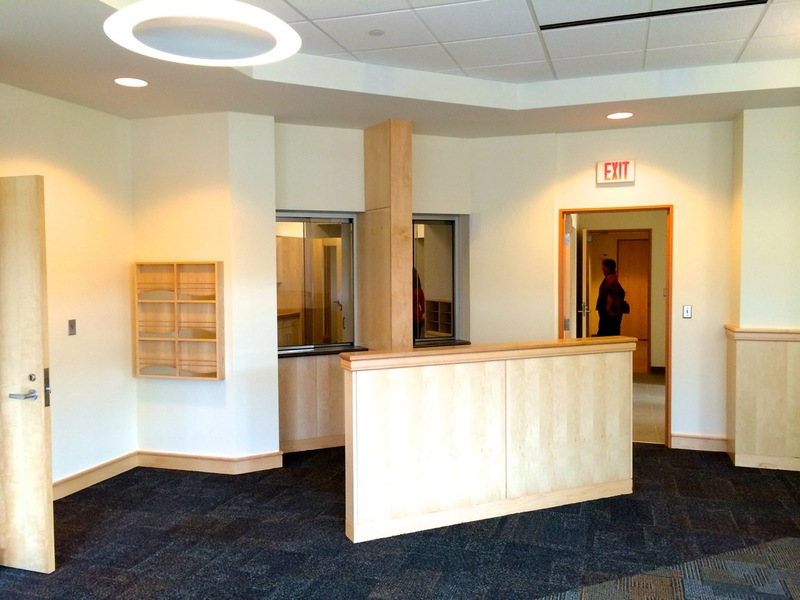 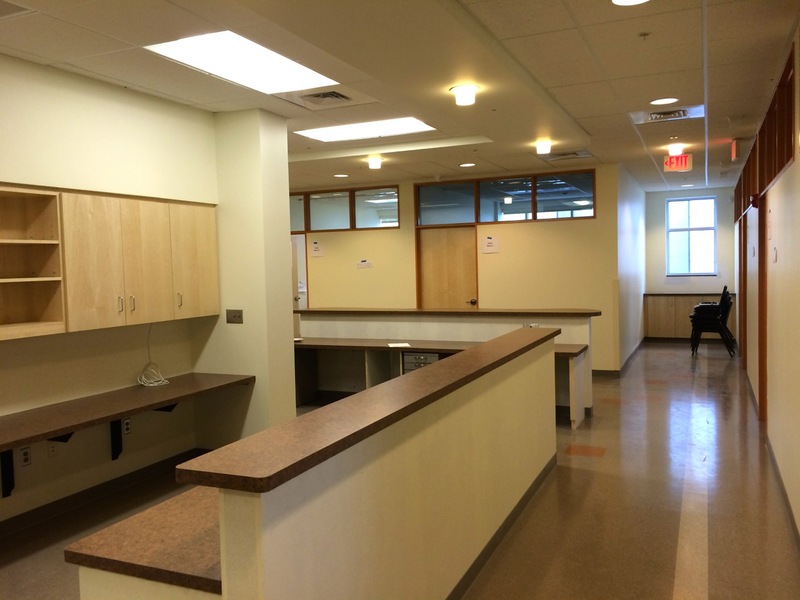 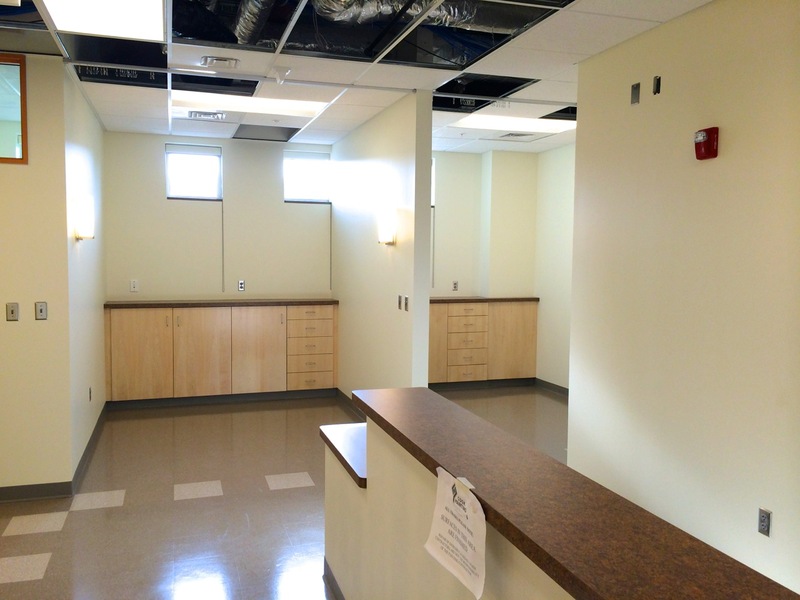 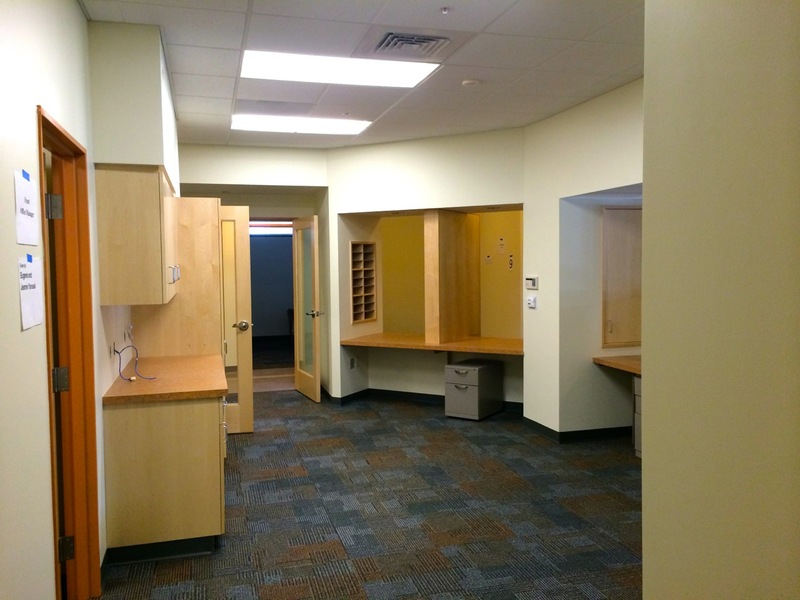 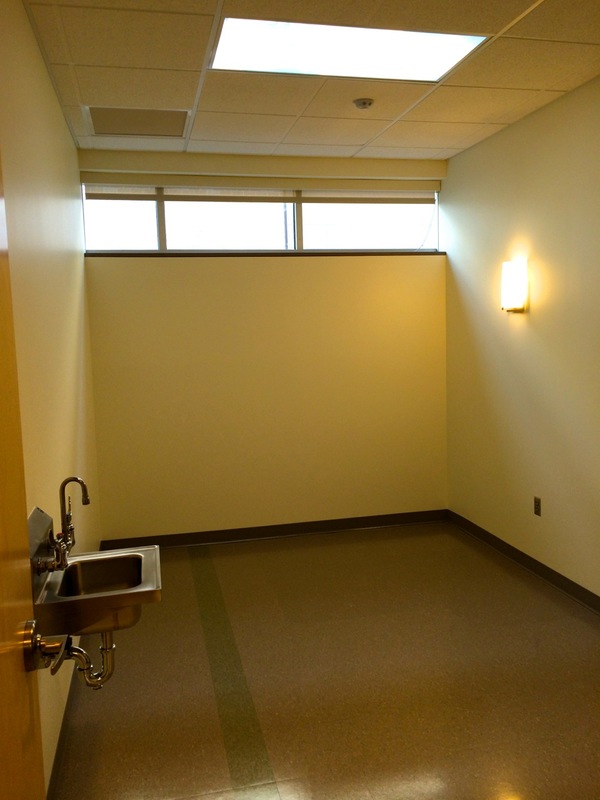 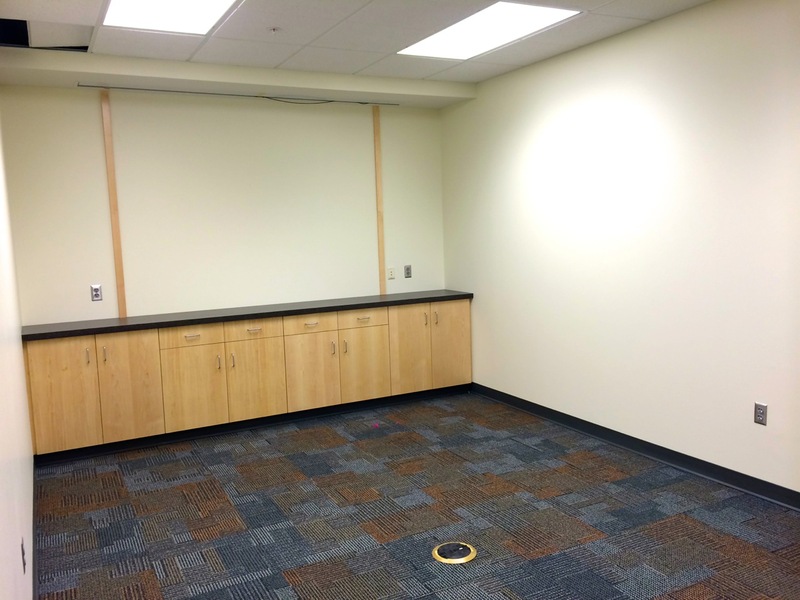 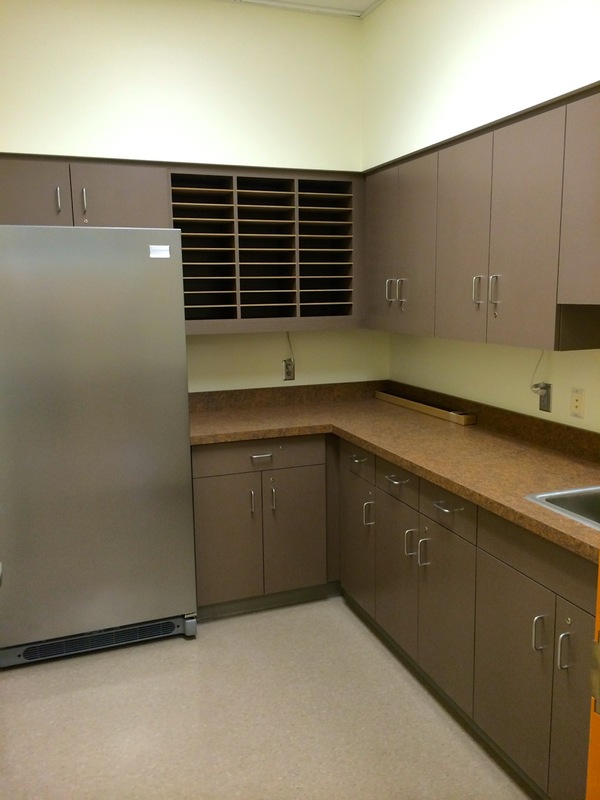 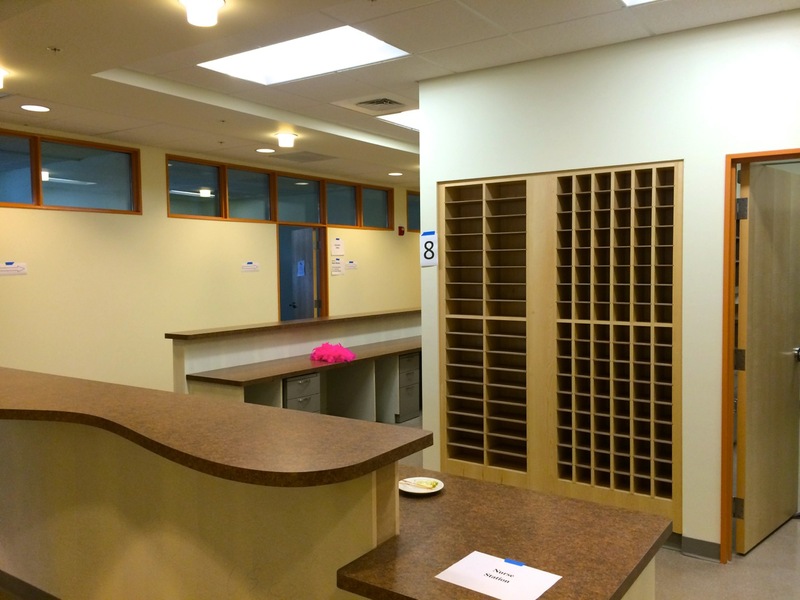 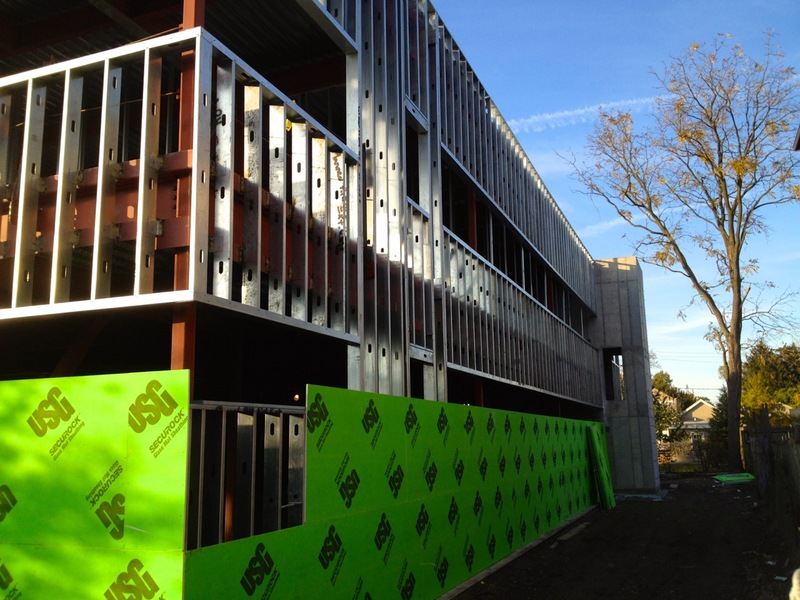 LeChase Construction is the general contractor on the project, which should be finishing up later this year. 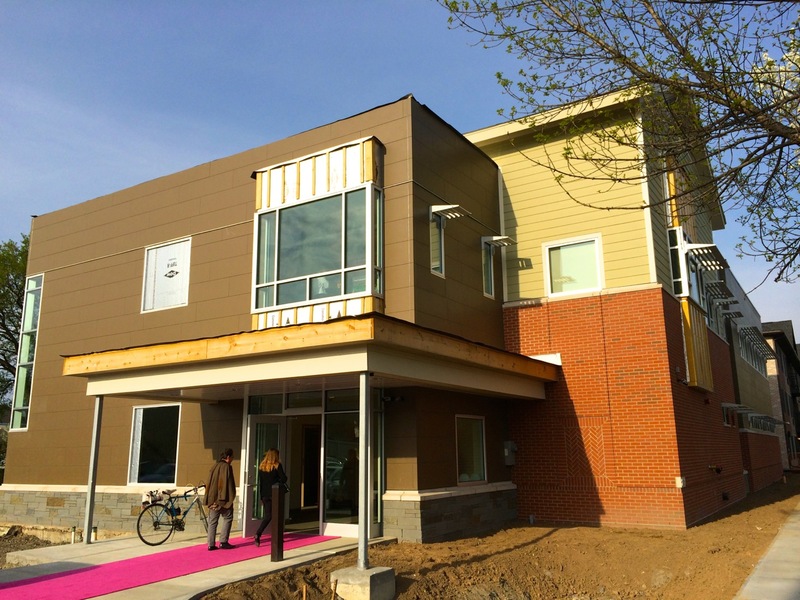 Here are some updated shots of the 16,000 square foot Planned Parenthood project on Seneca Street between Meadow and Fulton. 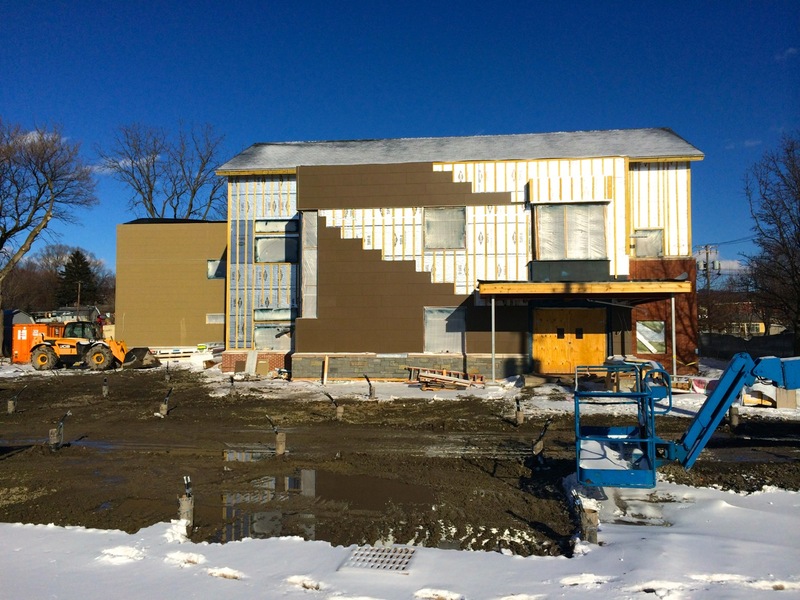 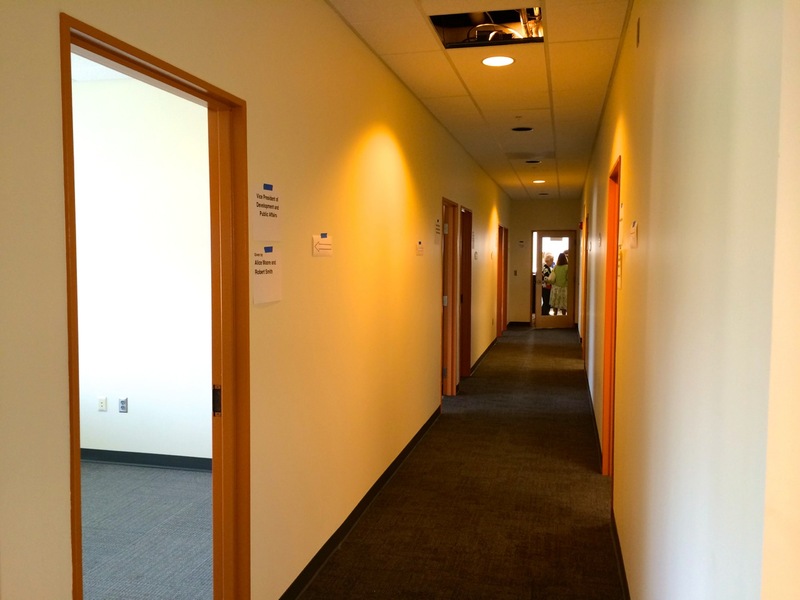 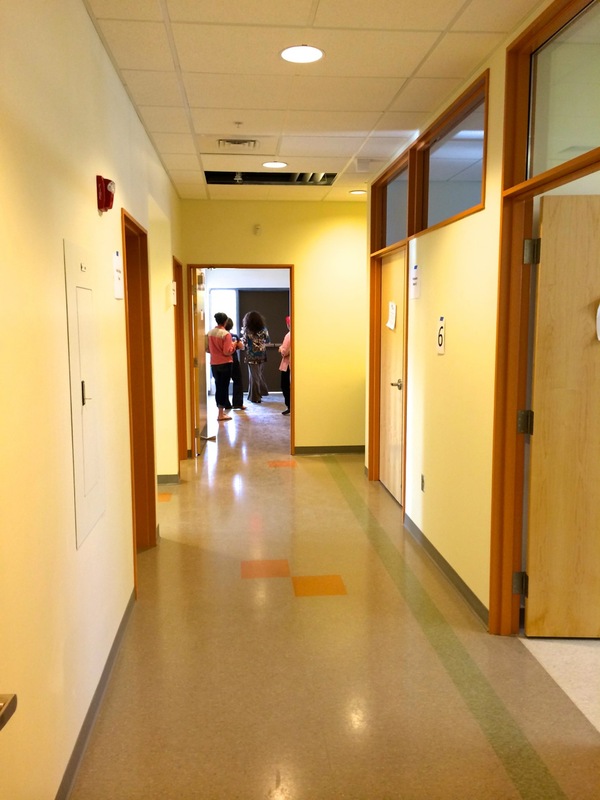 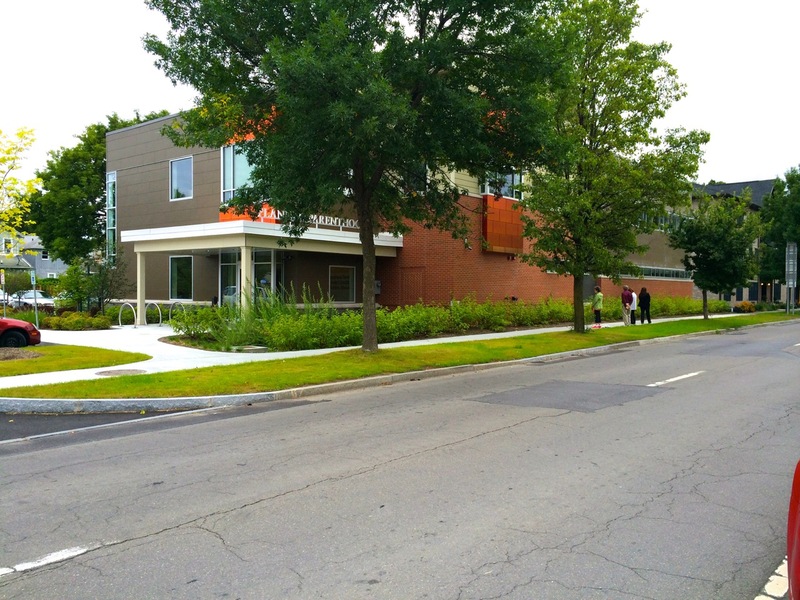 The Ithaca Times carried a write-up a few weeks ago about the future new building here in Ithaca, and about the programs the organization offers to the public. 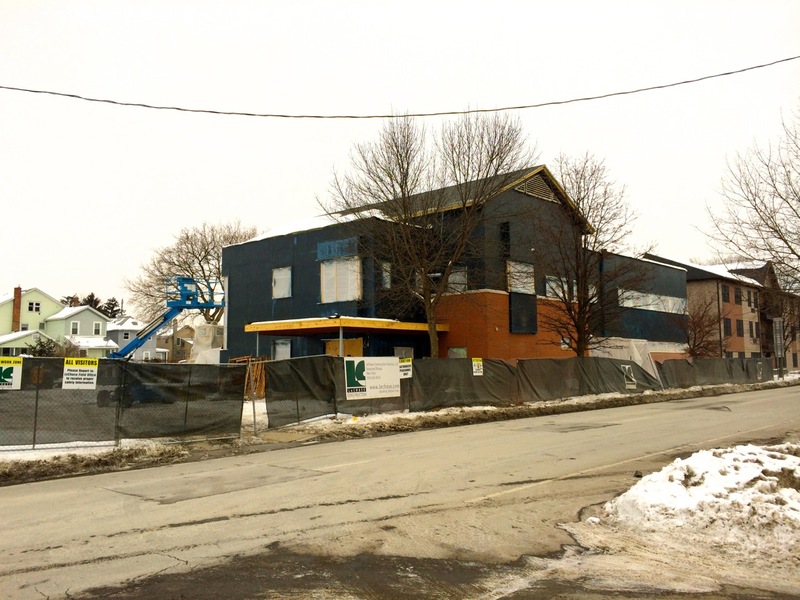 Joe Sammons, President of Planned Parenthood of the Southern Finger Lakes said that the second story will be housing offices for the education and community programming, and the first story will be devoted to health center operations, but that the building will essentially double the capacity of their current operation here in Ithaca. 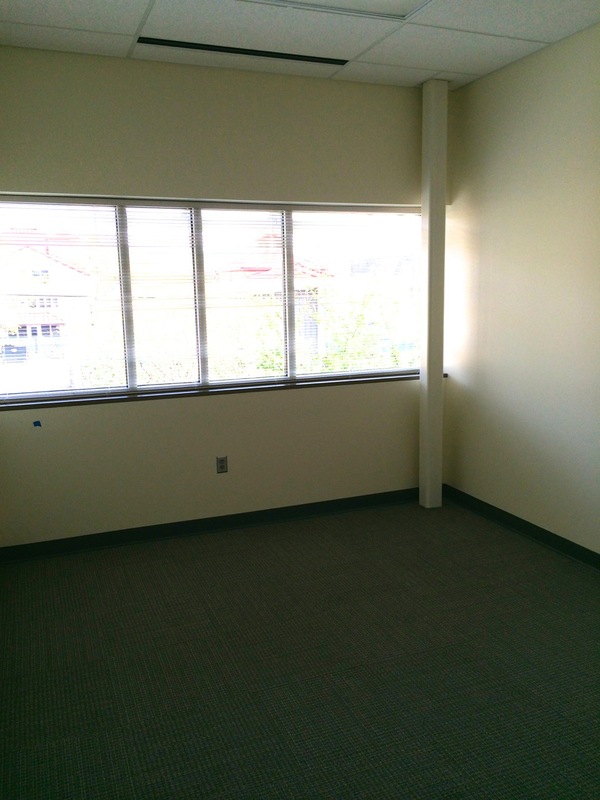 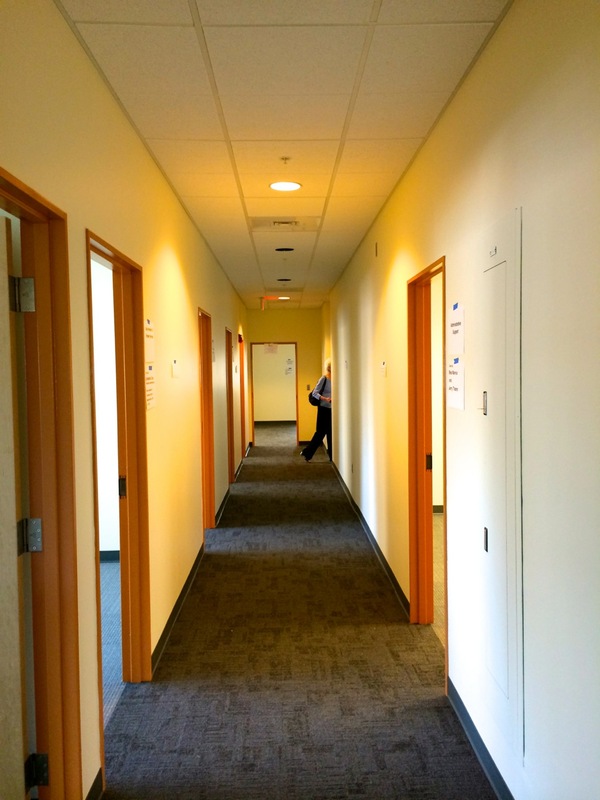 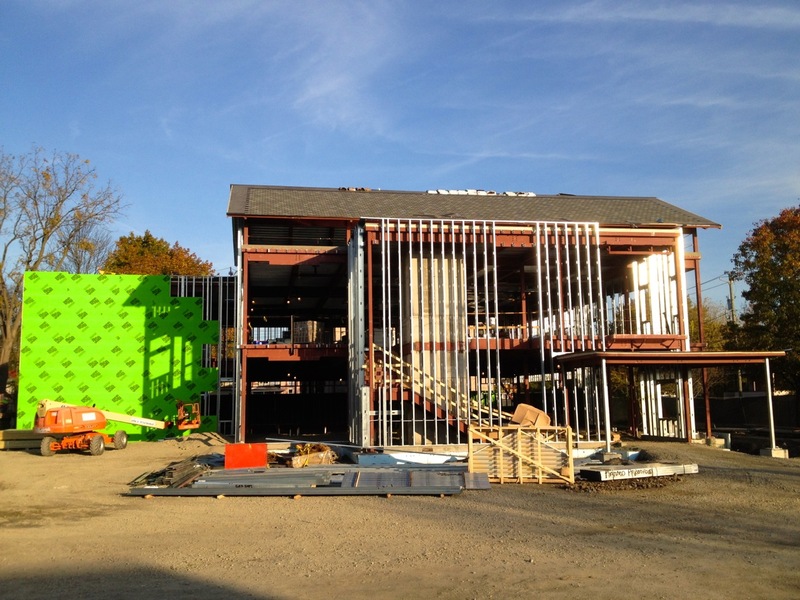 It will be the first building the organization has built from the ground up. 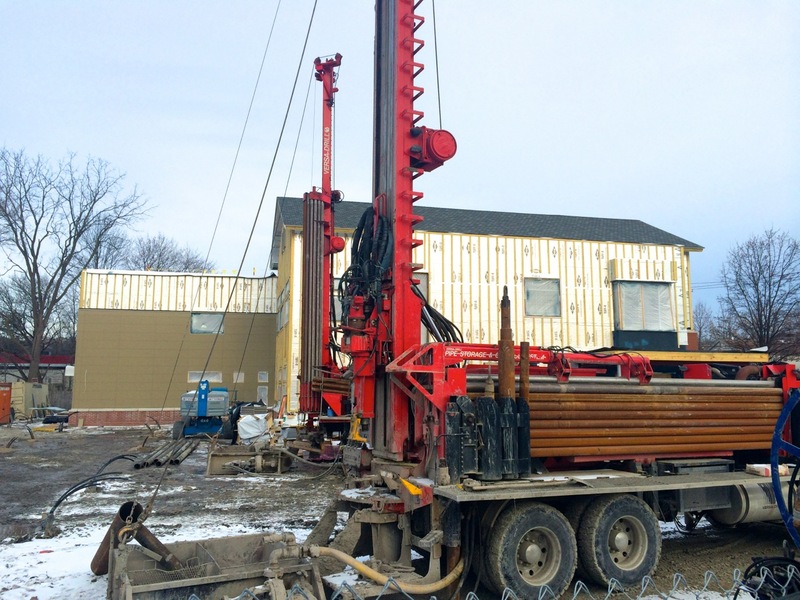 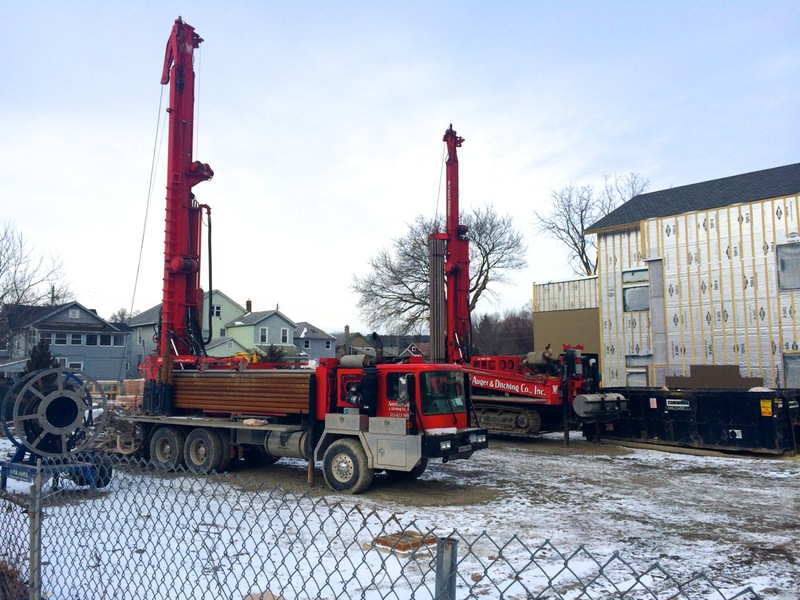 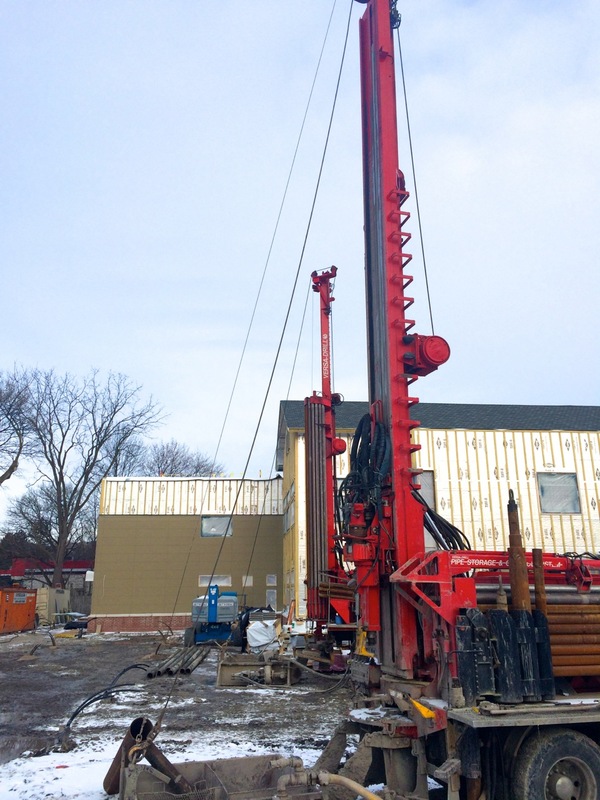 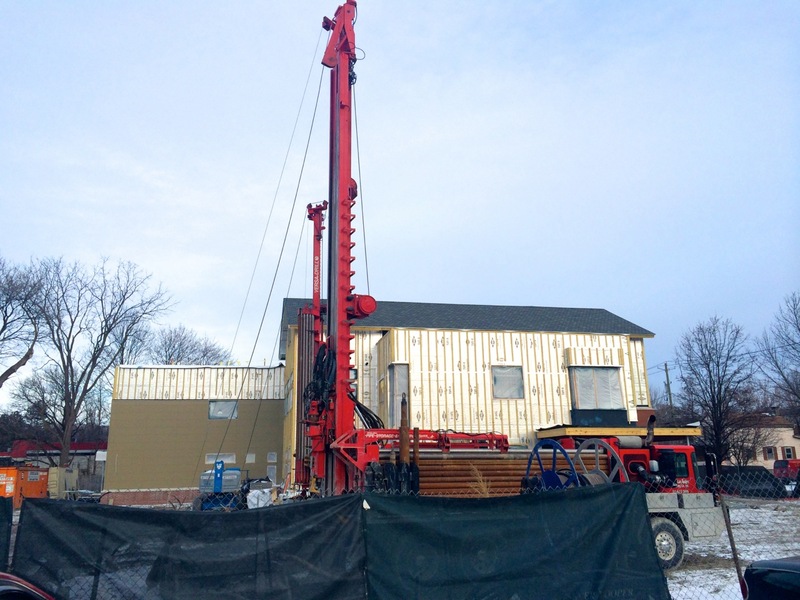 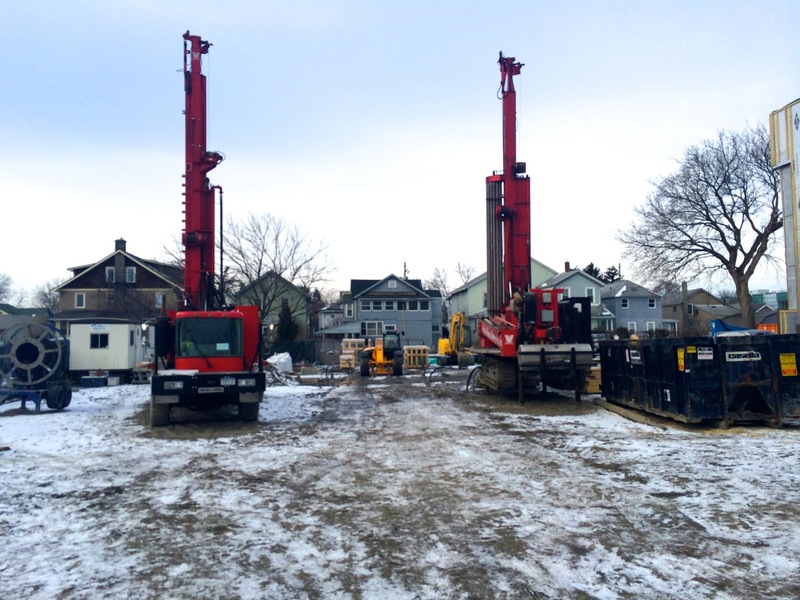 Joe also said that the building will contain a geothermal heating system, which answers the question of why there was such a big drilling rig on site before the building construction began. 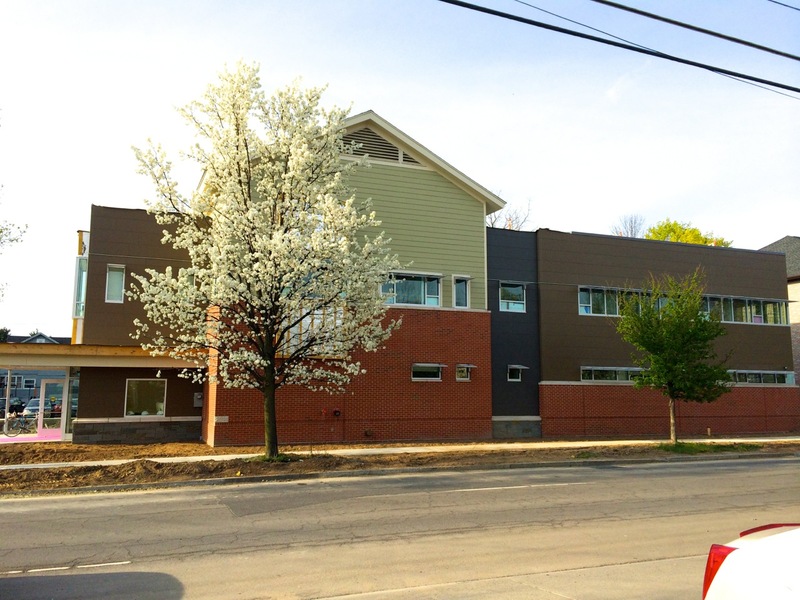 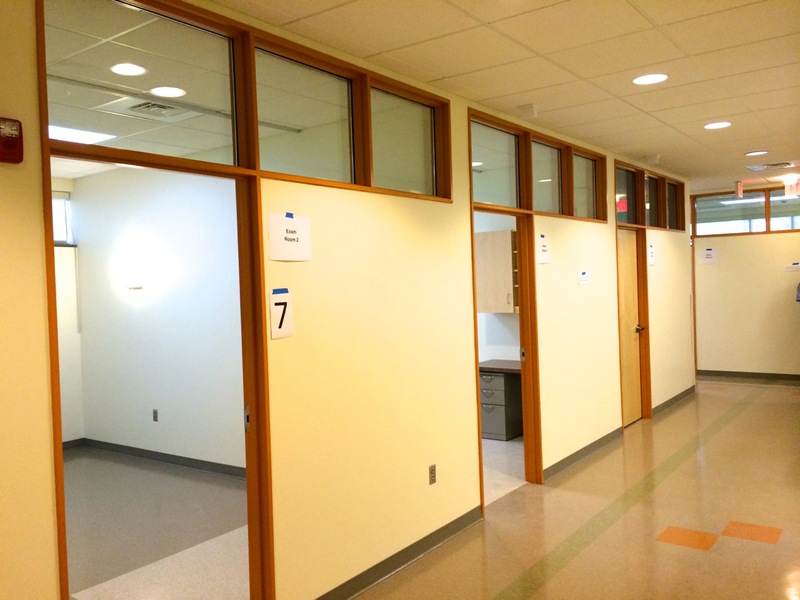 The building is estimated to cost $6.12 million, out of the total $8 million investment being made here, in Corning, and Hornell to develop three health centers. 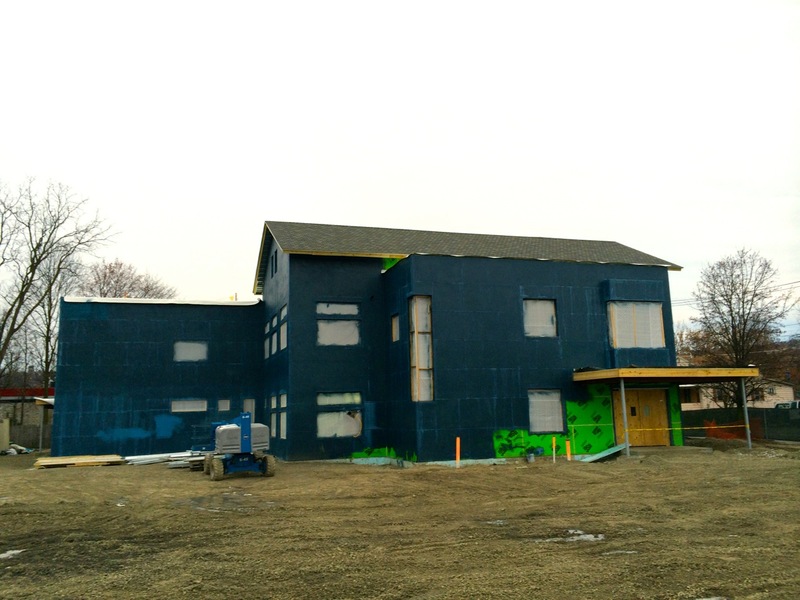 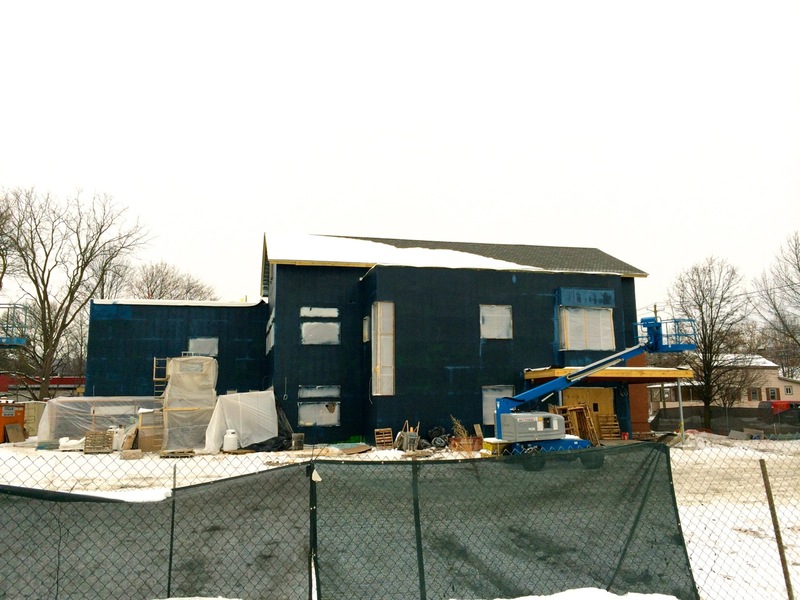 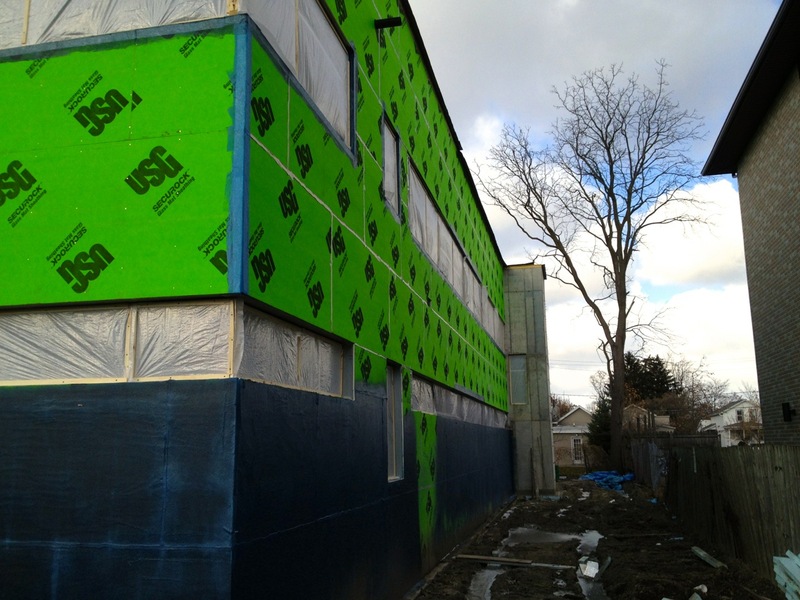 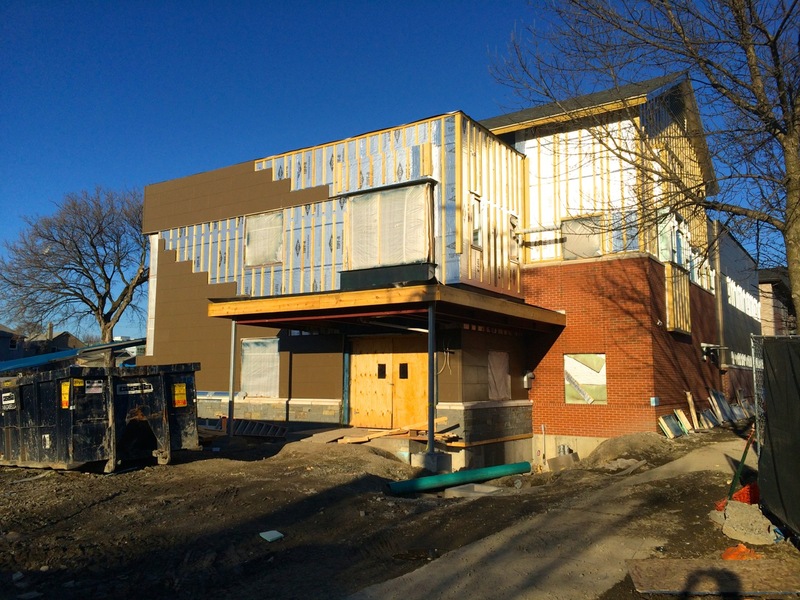 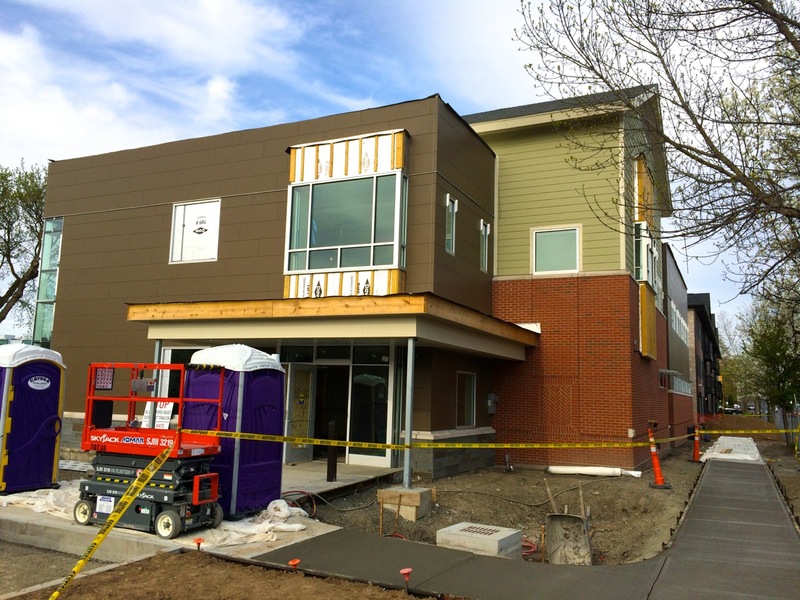 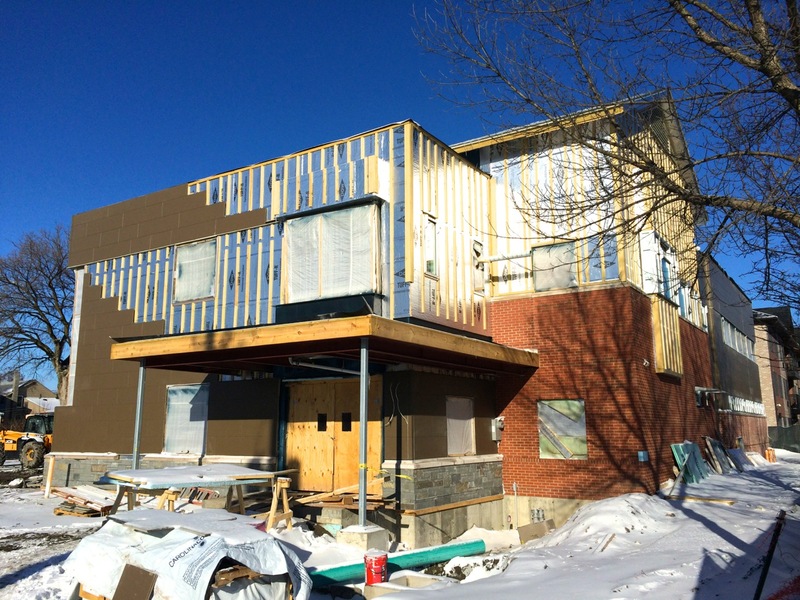 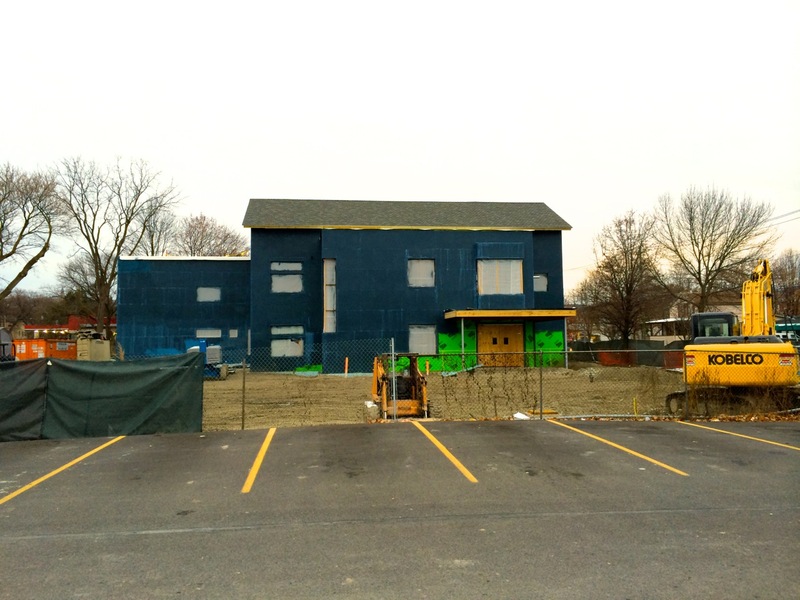 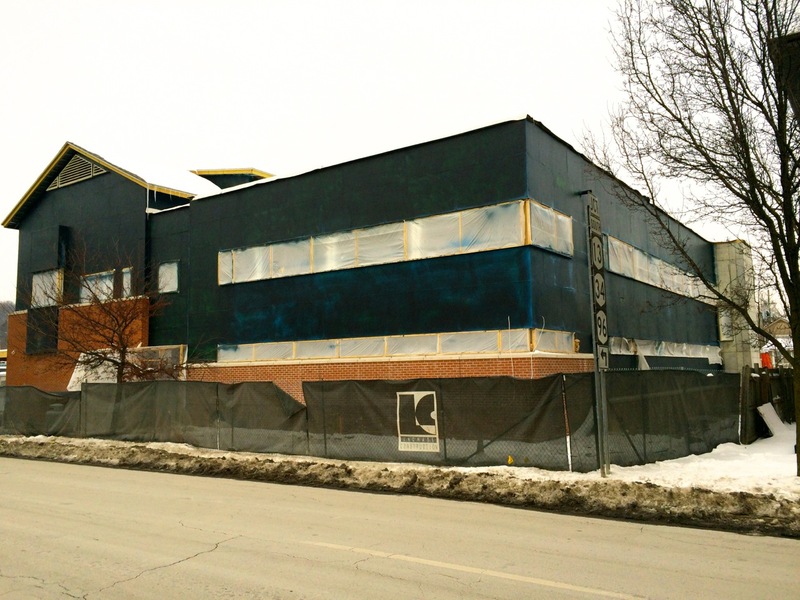 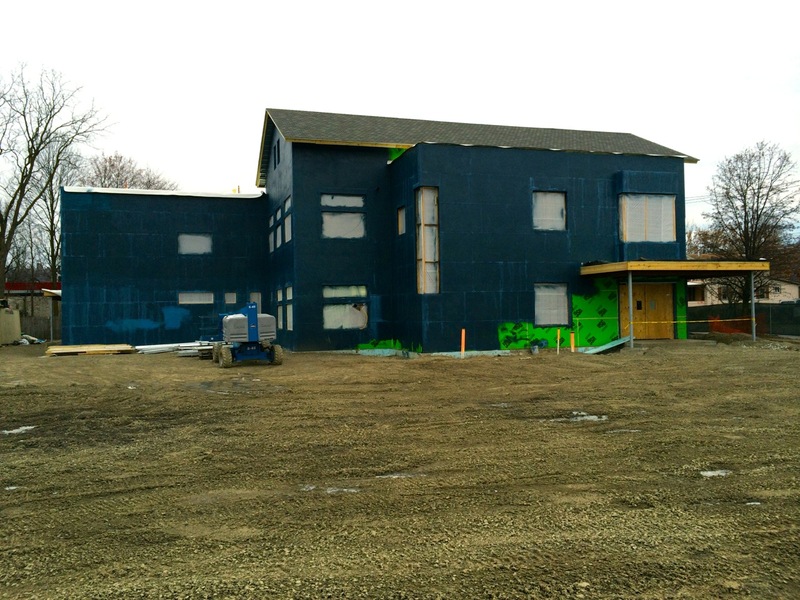 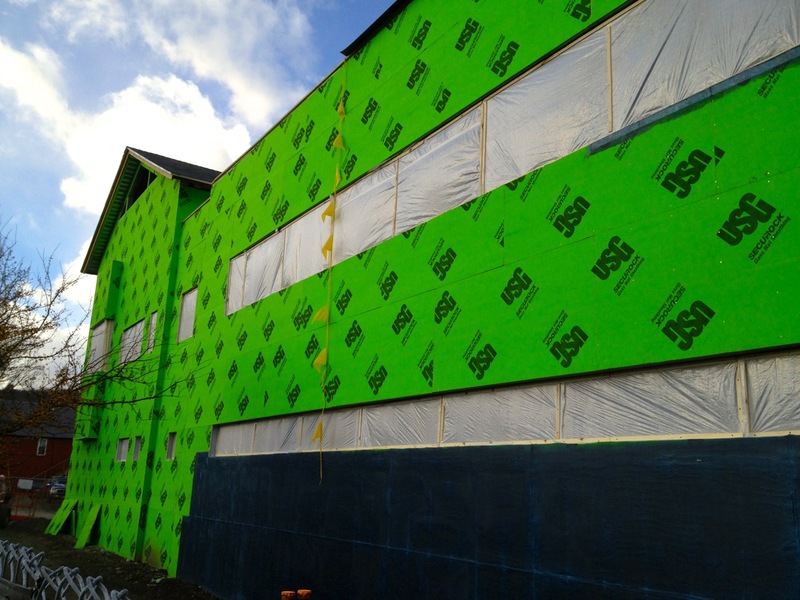 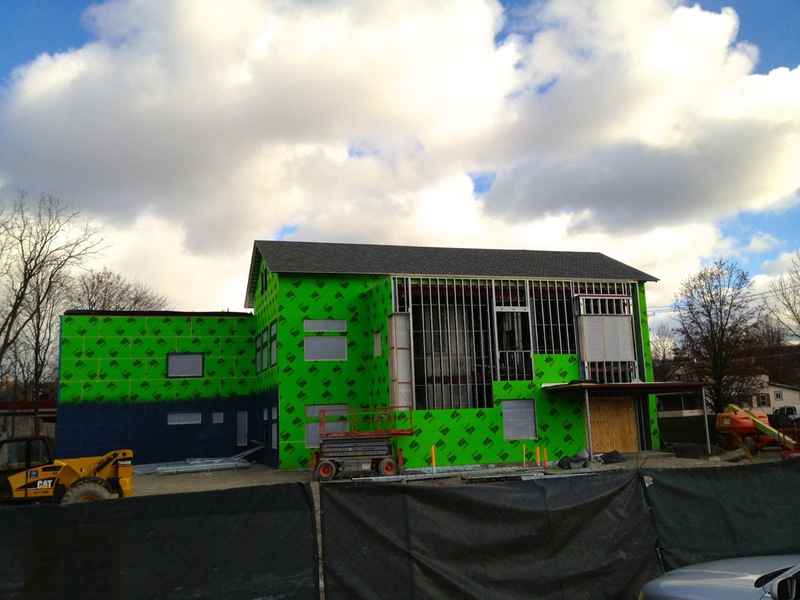 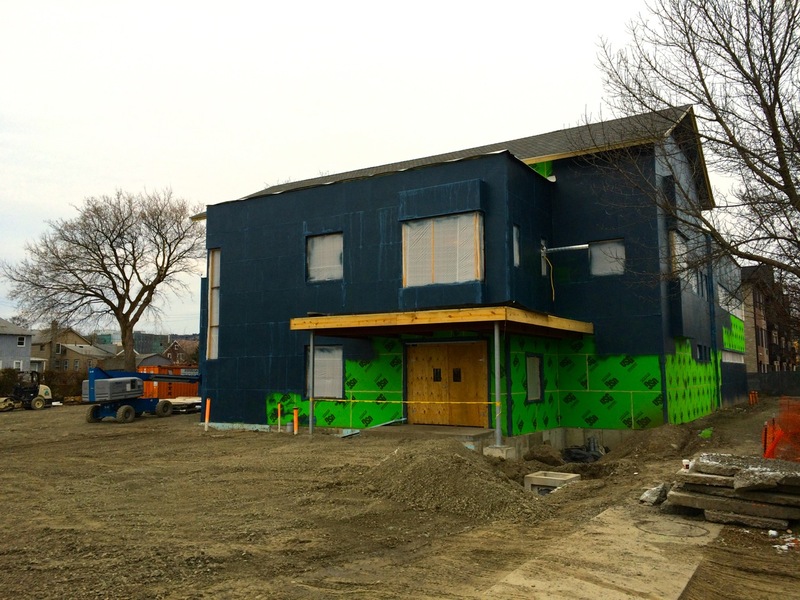 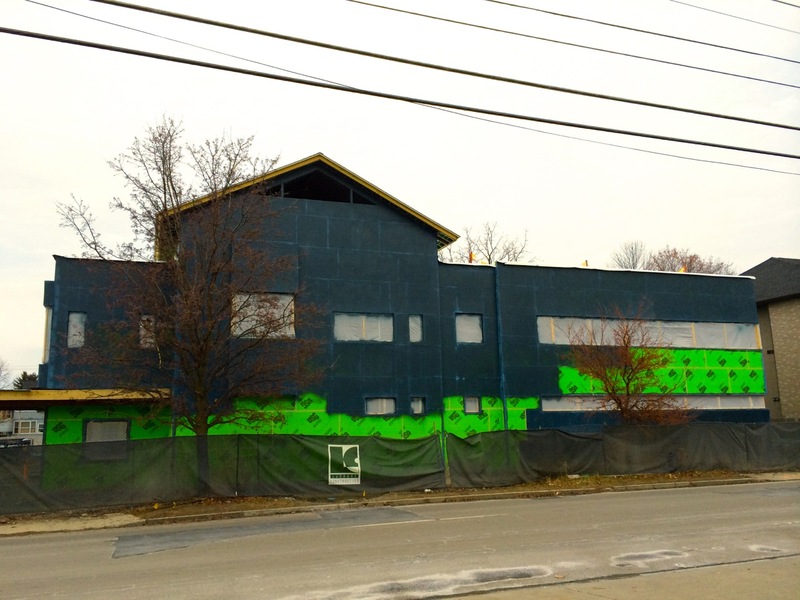 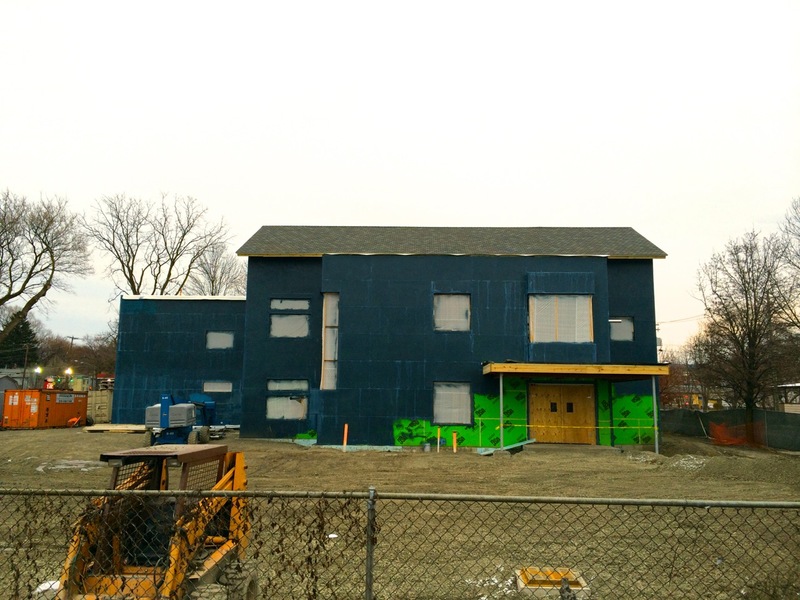 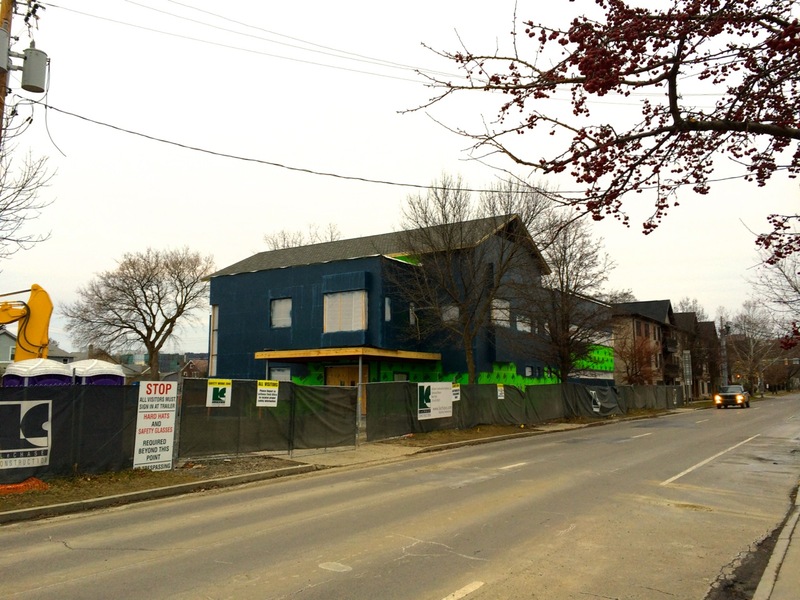 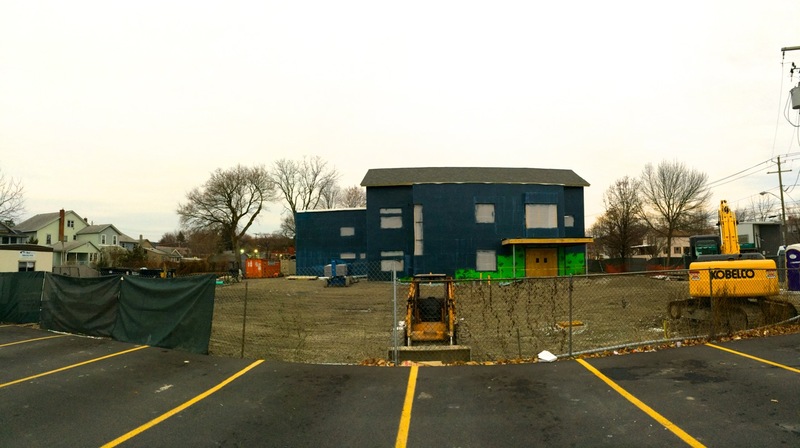 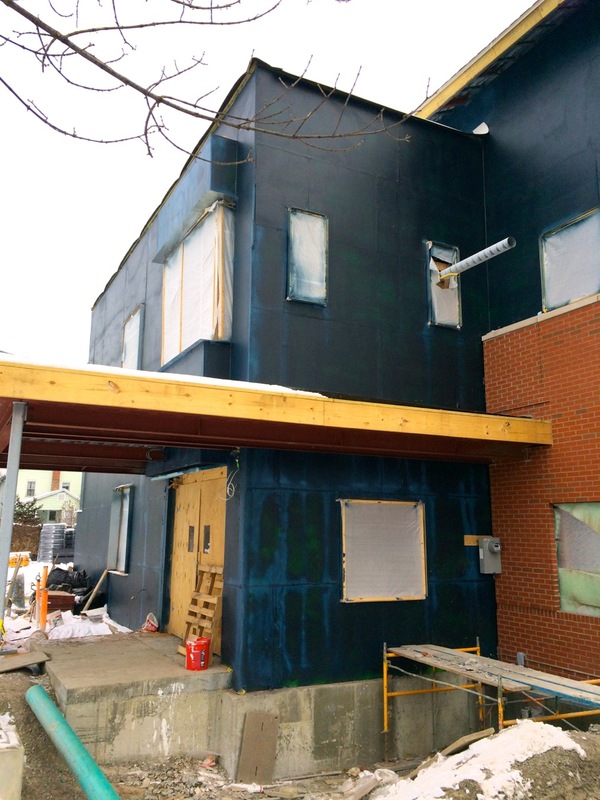 As far as construction, the sheathing has been completed, and the blue coating is probably a water resistive barrier spray that goes on before the facade is installed, which will primarily be a combination of fiber cement panels. 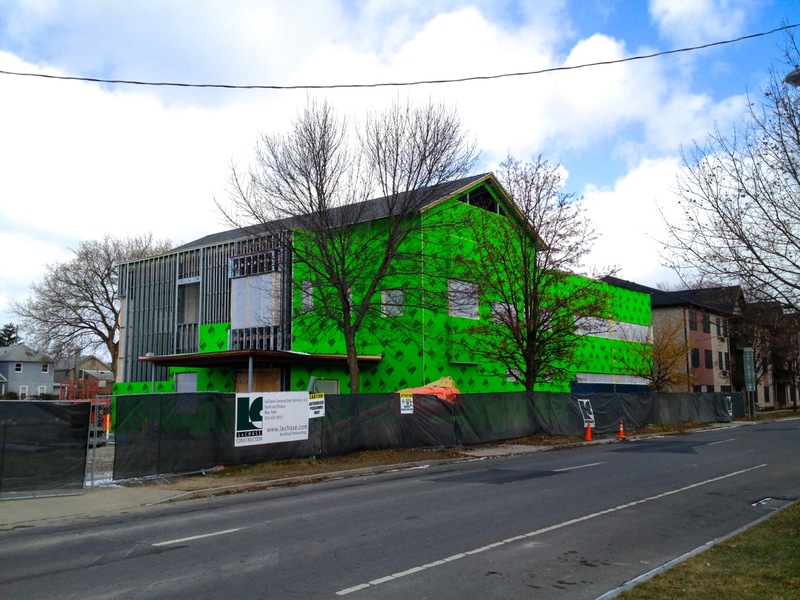 I actually drove by yesterday and now the project is fully closed-in with glass-mat sheathing and the window openings covered with plastic sheeting. 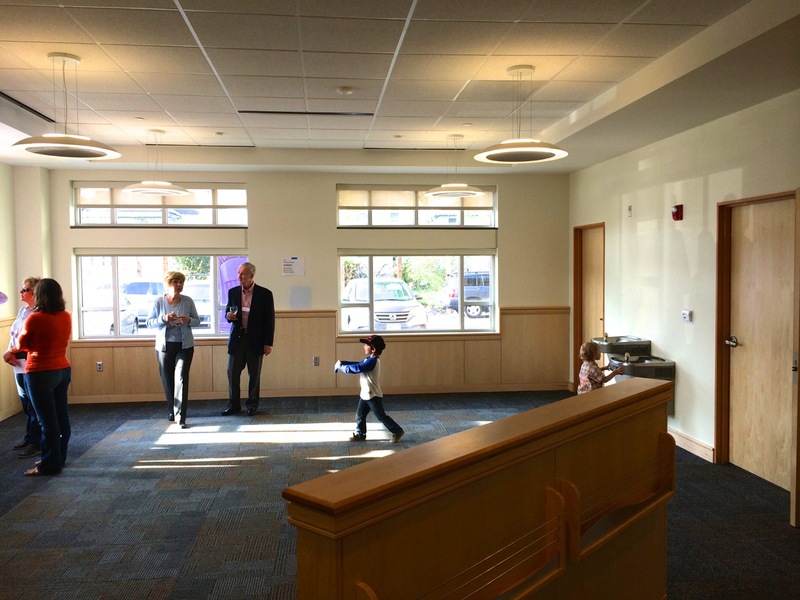 Here are some photos taken this past Sunday. 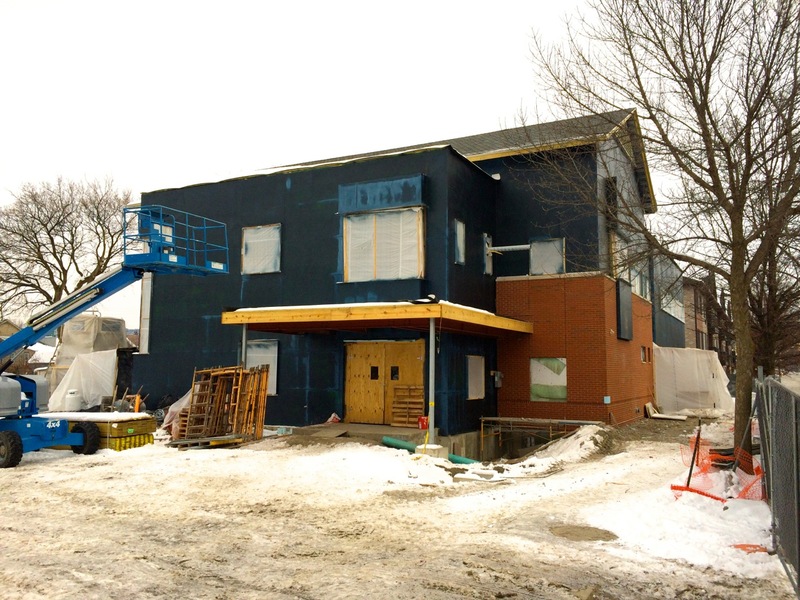 We may not see much outside change on this one until it’s time to put up the facade in slightly better weather, but it’s been quite a fast project so far. 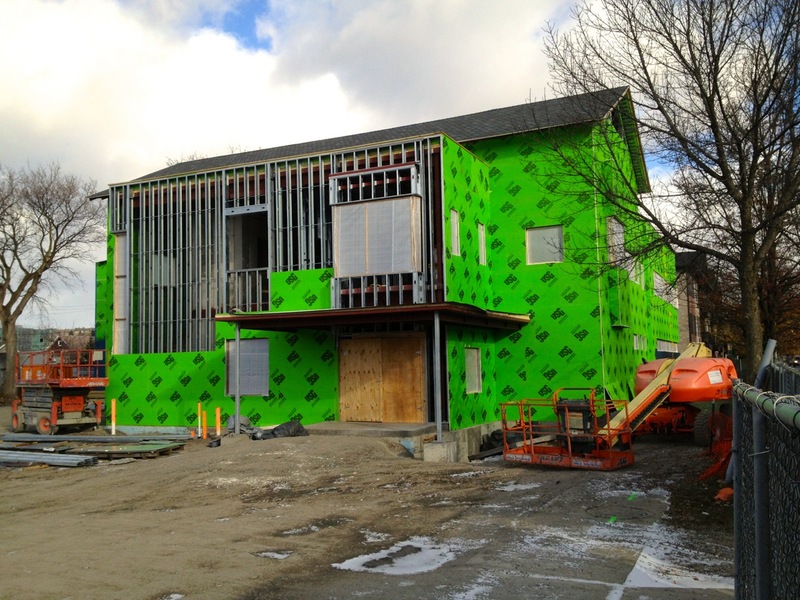 I can see that some of the interior walls have been framed-out as more glass-mat sheathing has been going up along the exterior walls. 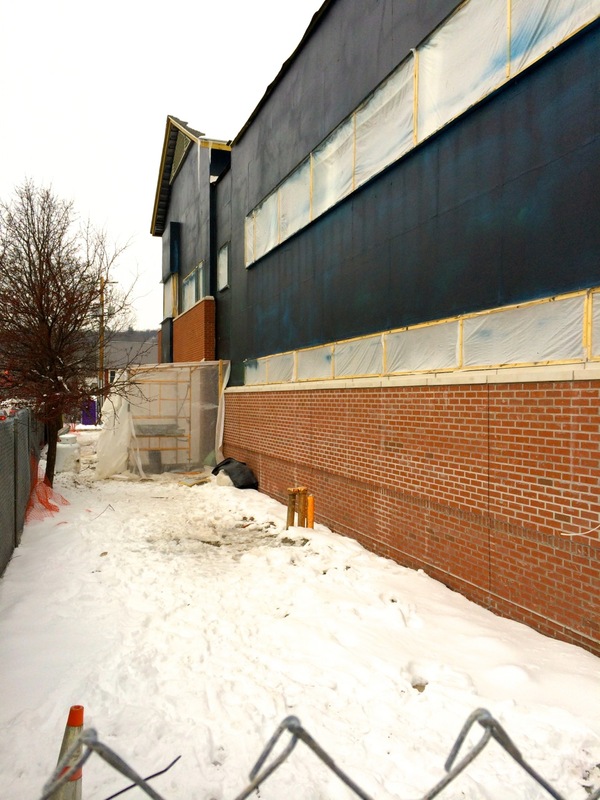 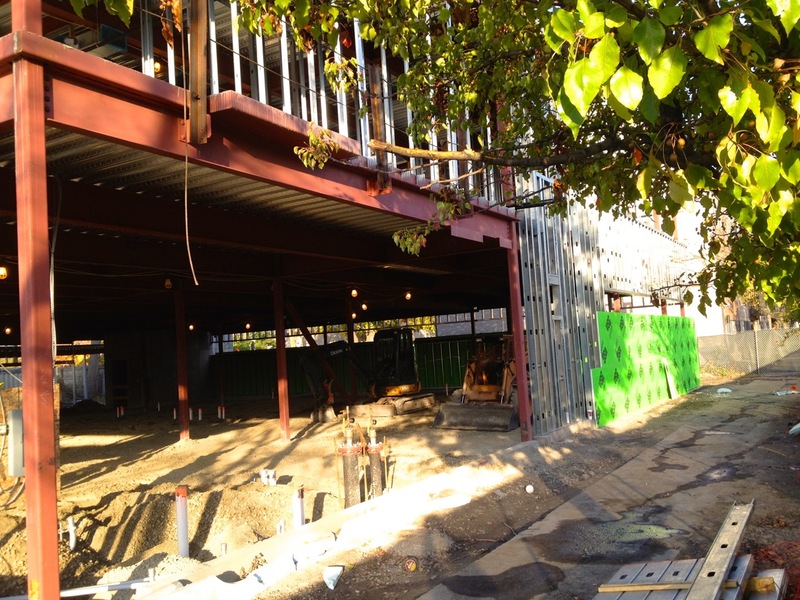 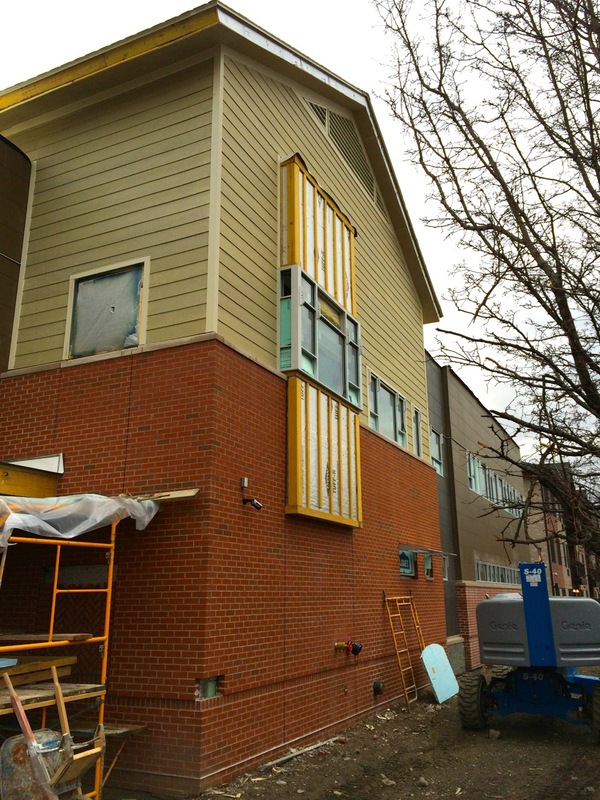 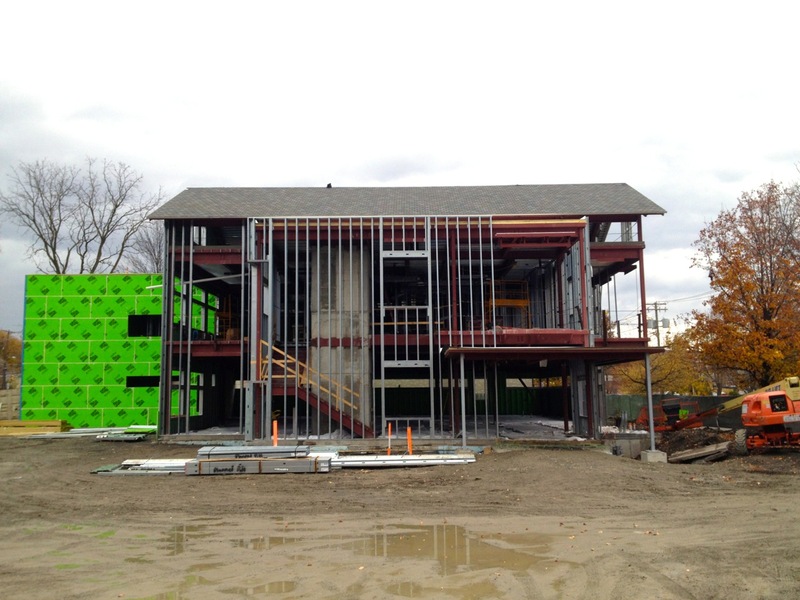 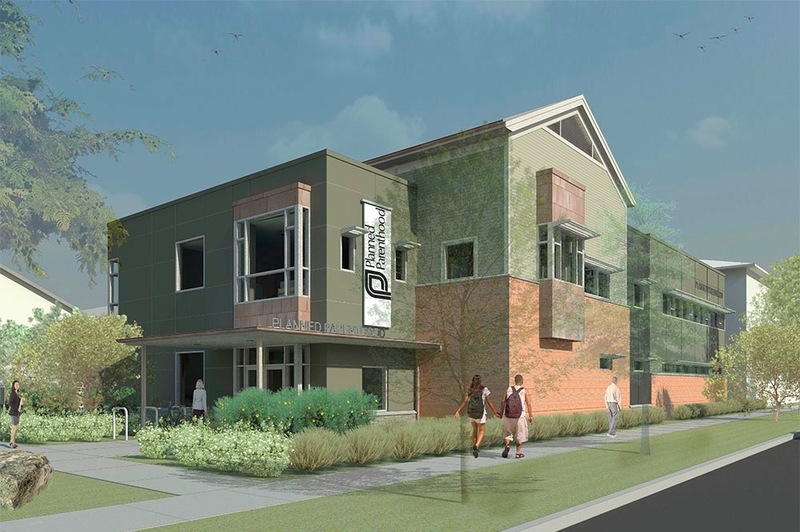 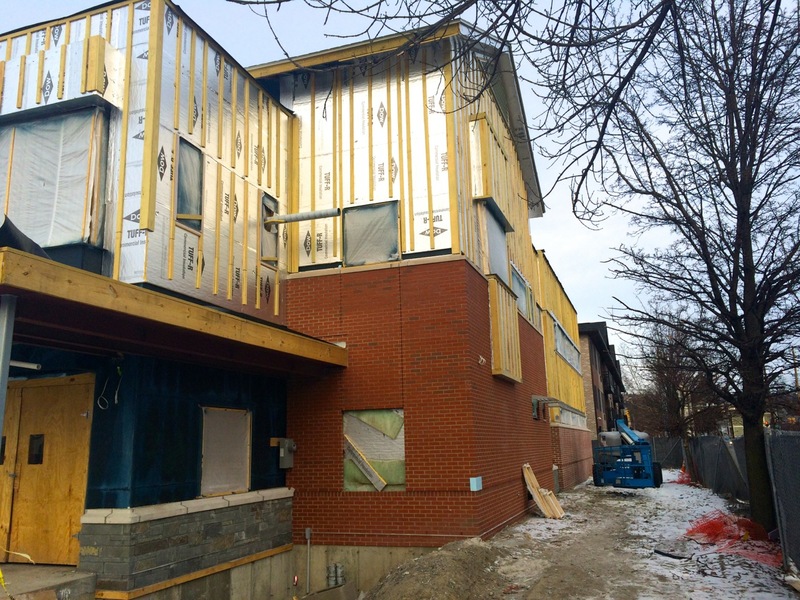 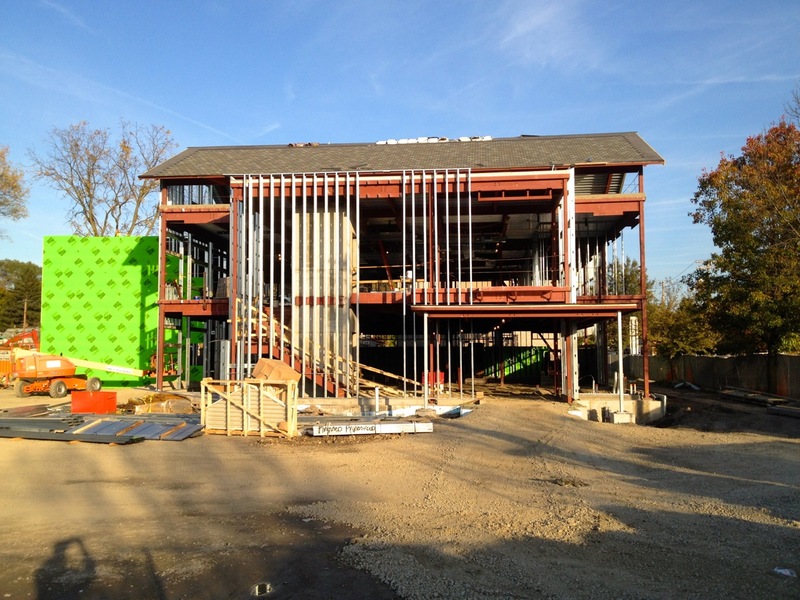 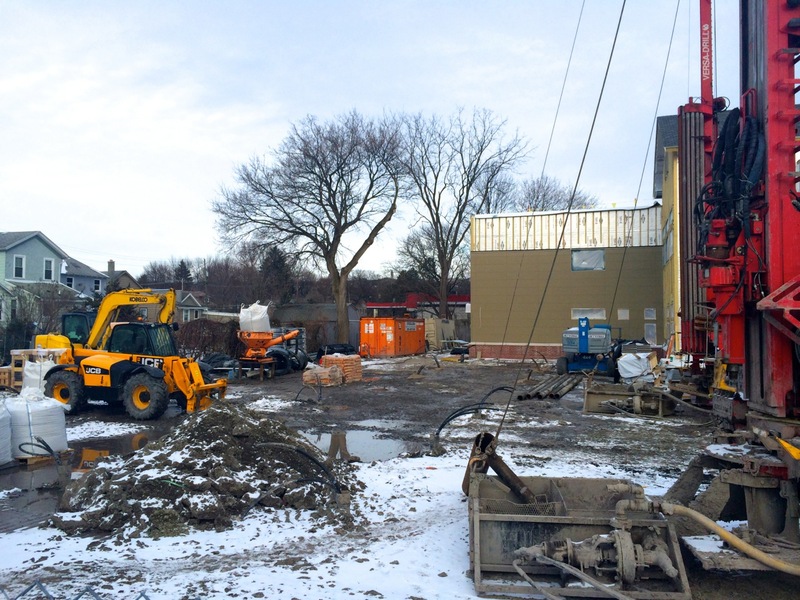 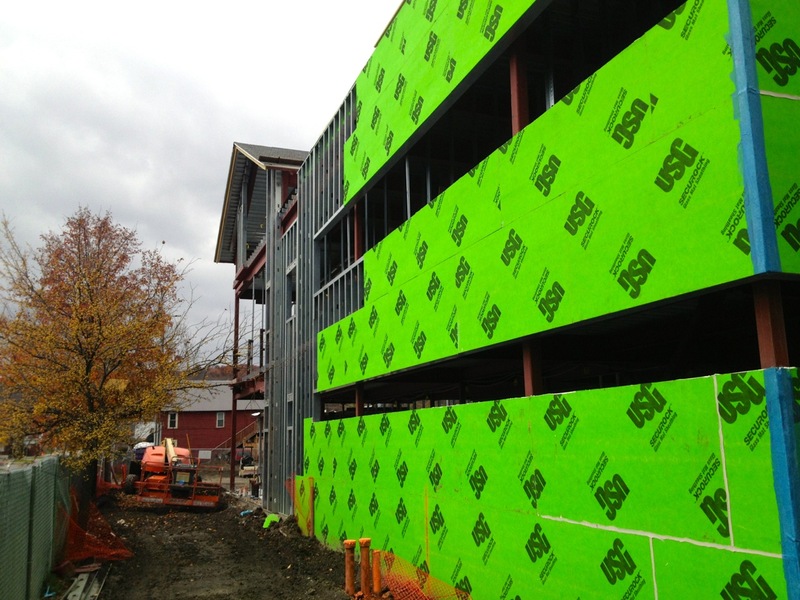 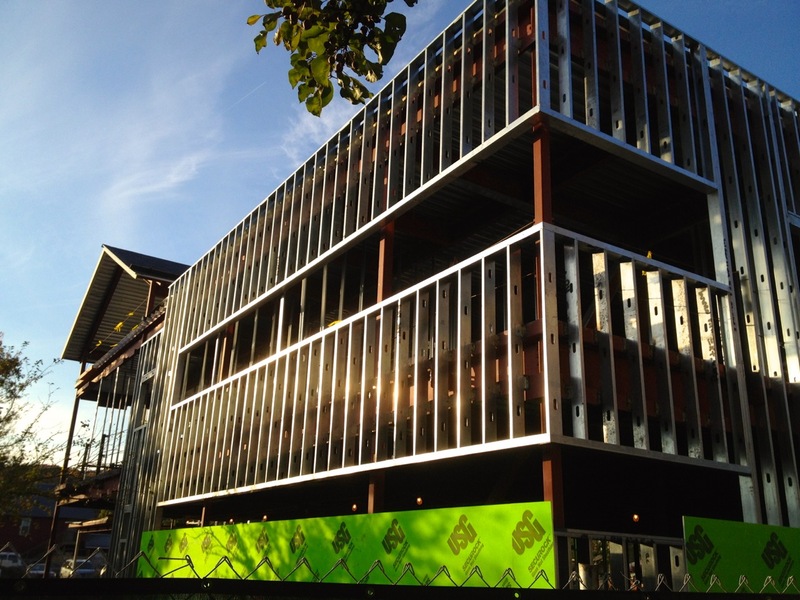 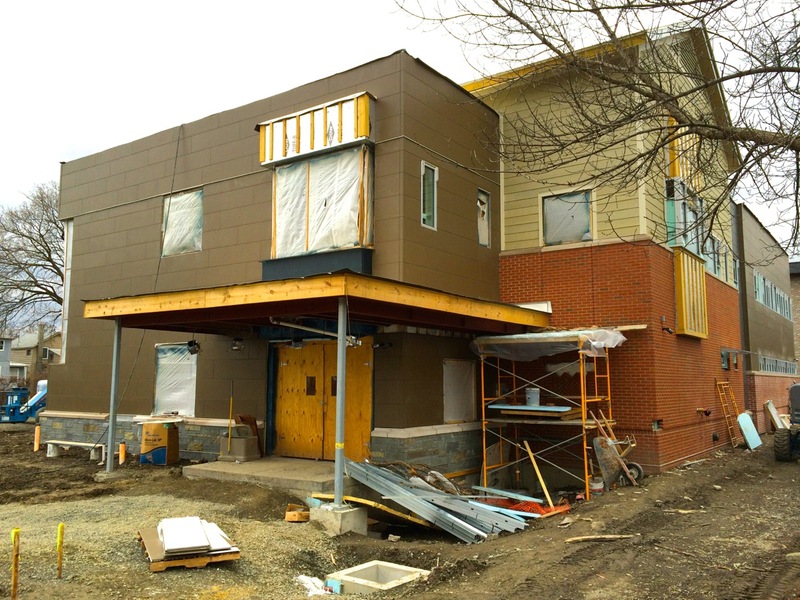 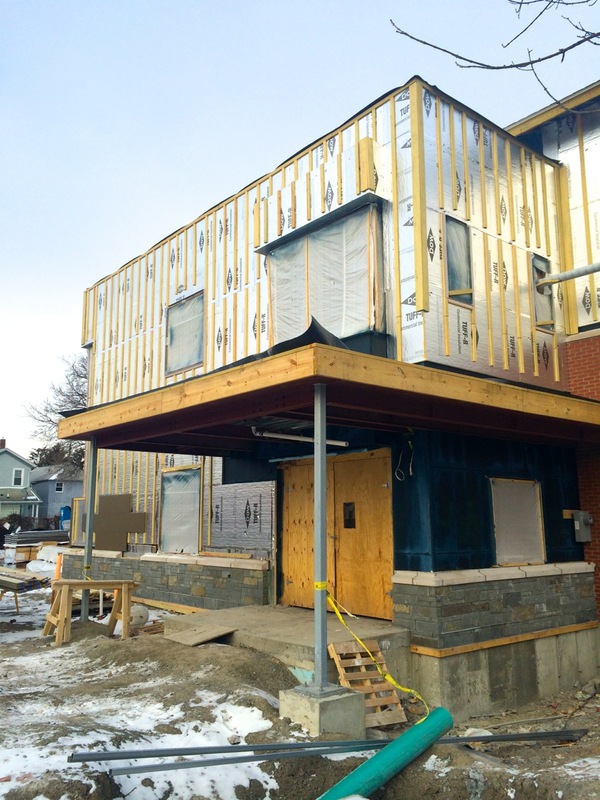 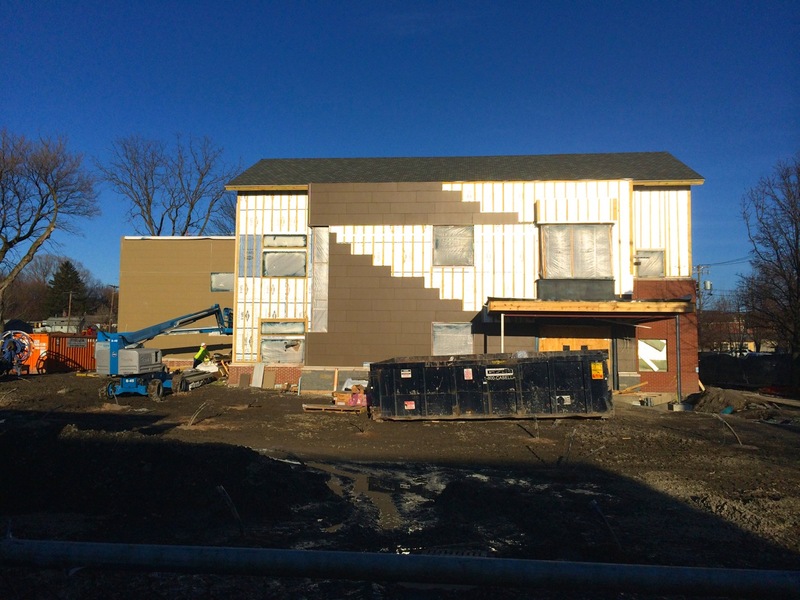 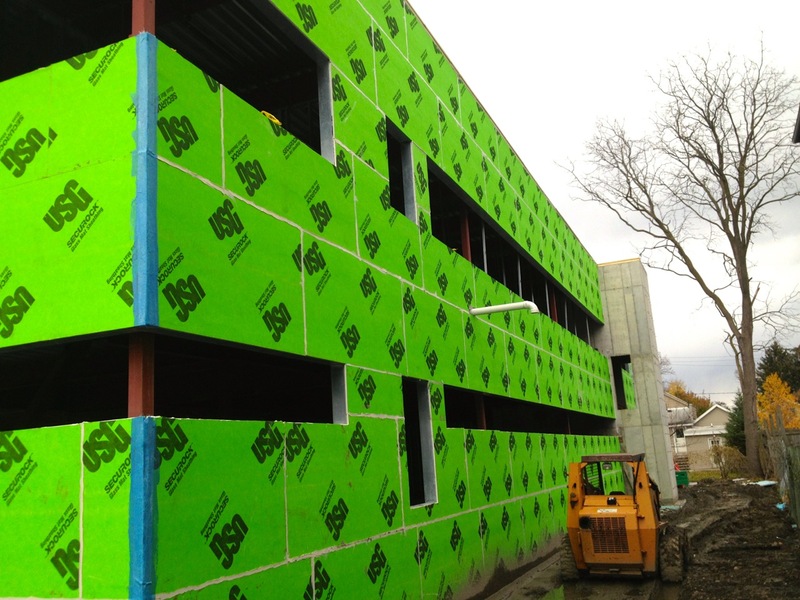 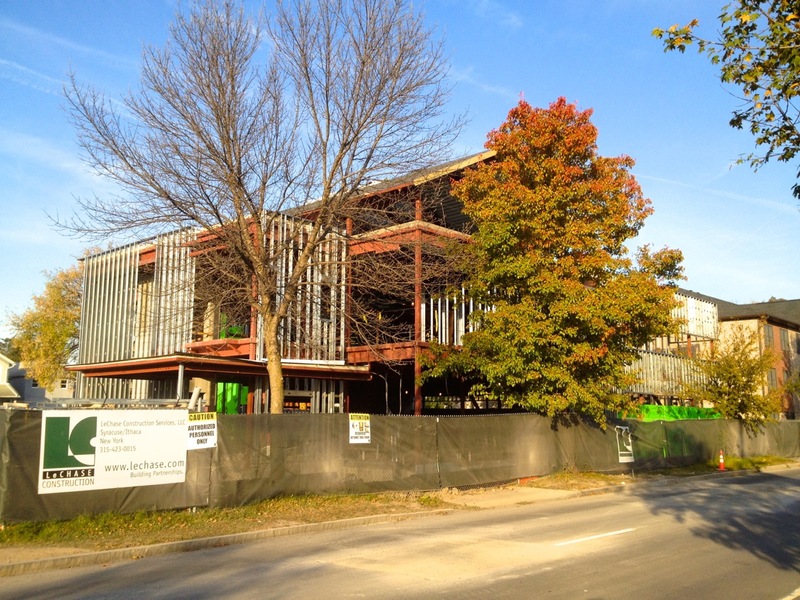 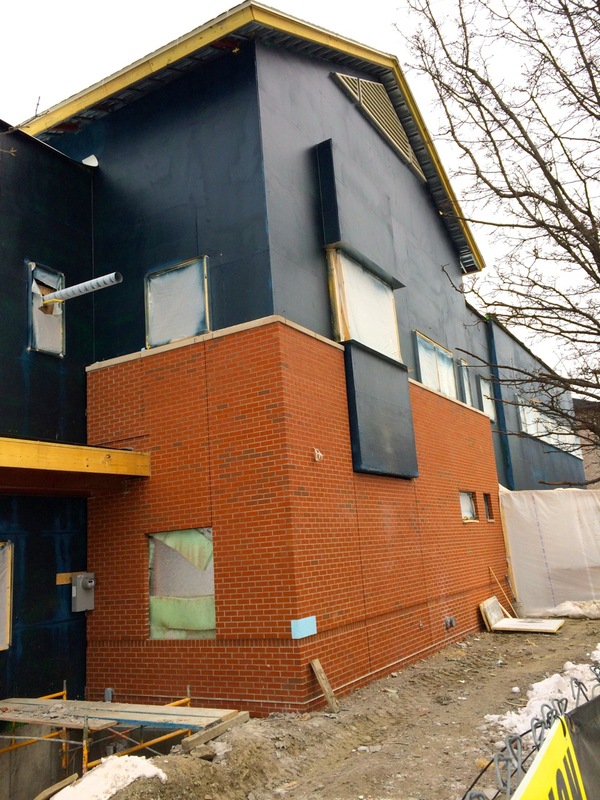 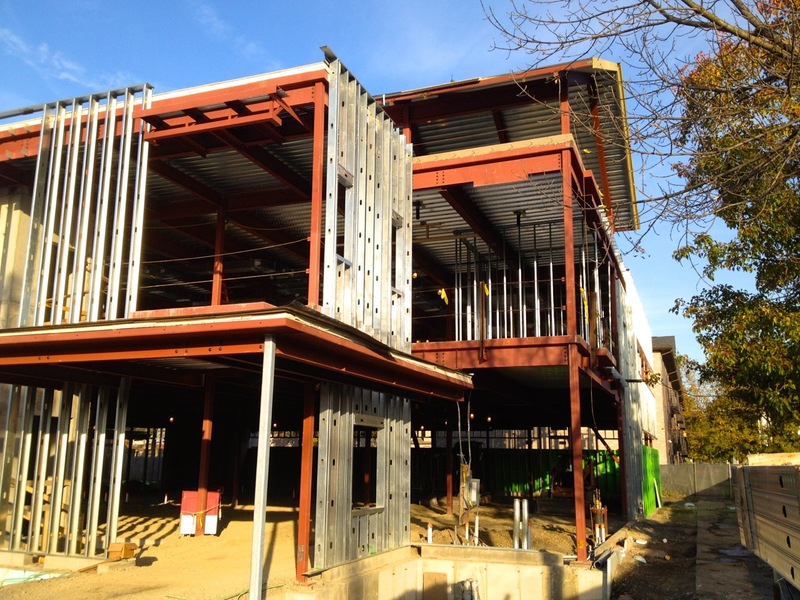 Once the exterior walls are closed-in, we’ll see a colorful variety of fiber cement panels installed to compose the facade of the building, along with a brick layer to form the base. 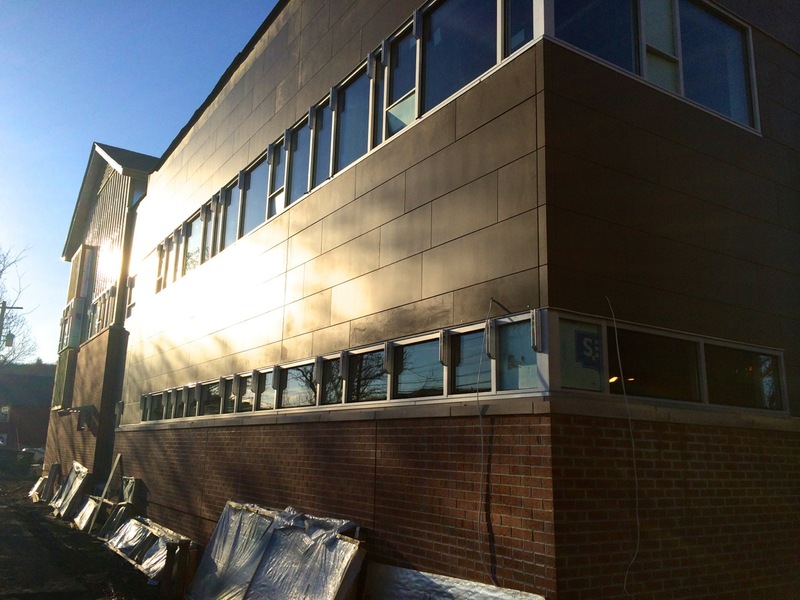 There will also be some metals panels around certain window popouts. 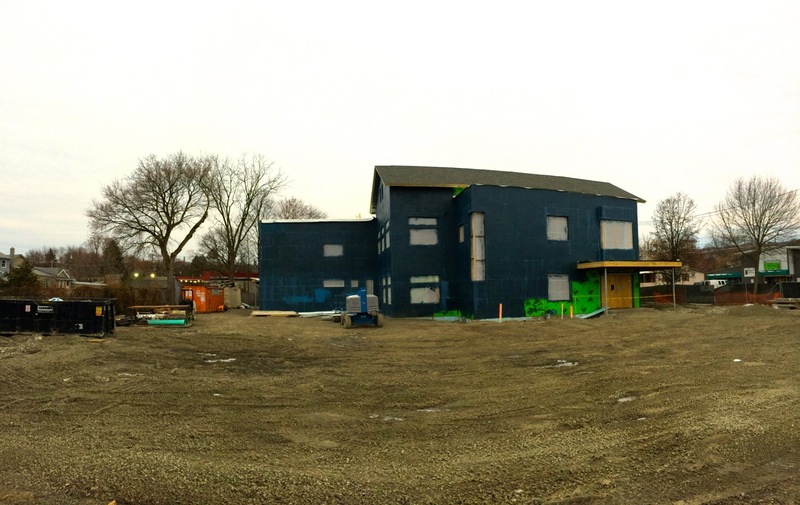 The site plans were posted here back in May, and the renders of the outside along with exterior details are on the last page. 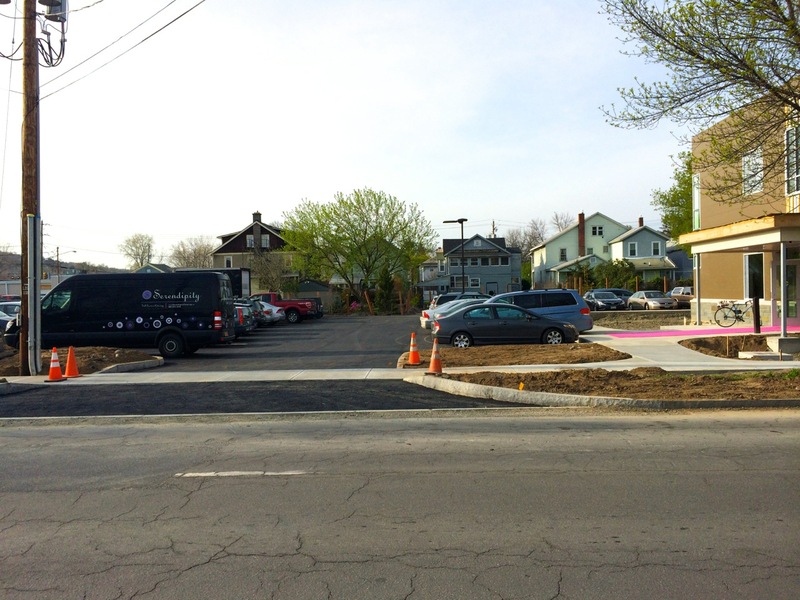 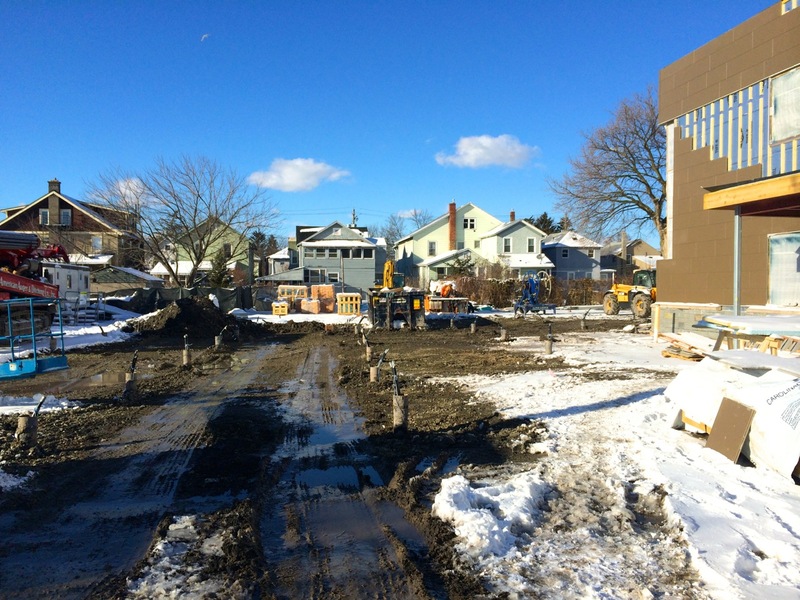 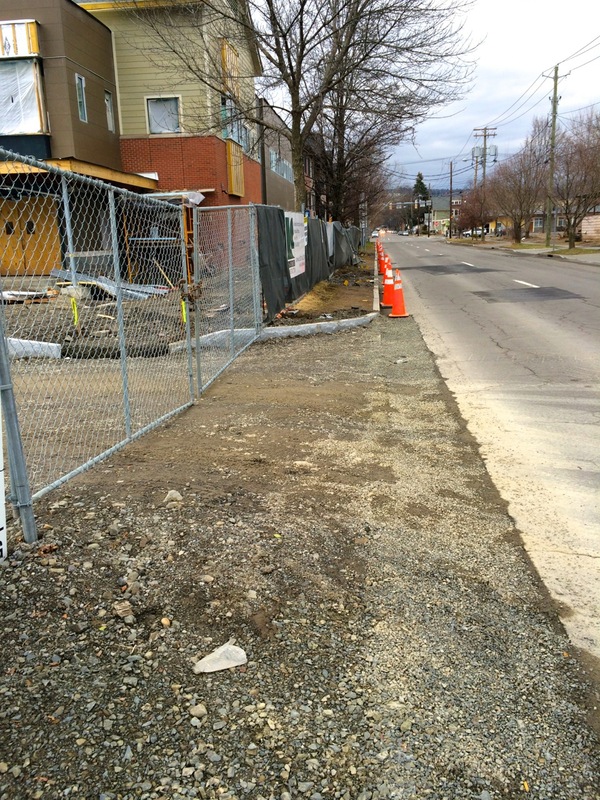 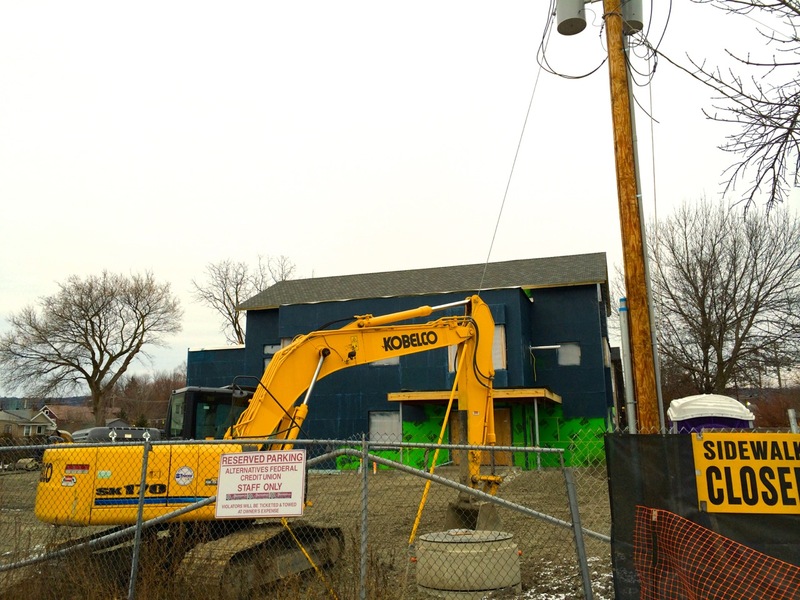 Here are some updated photos from last week of the Planned Parenthood project on Seneca Street in the west end Route 13 split. 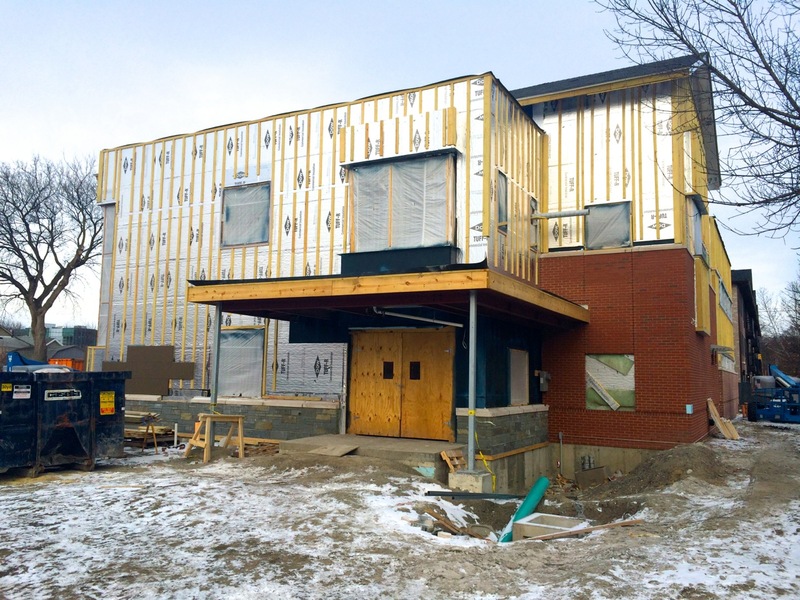 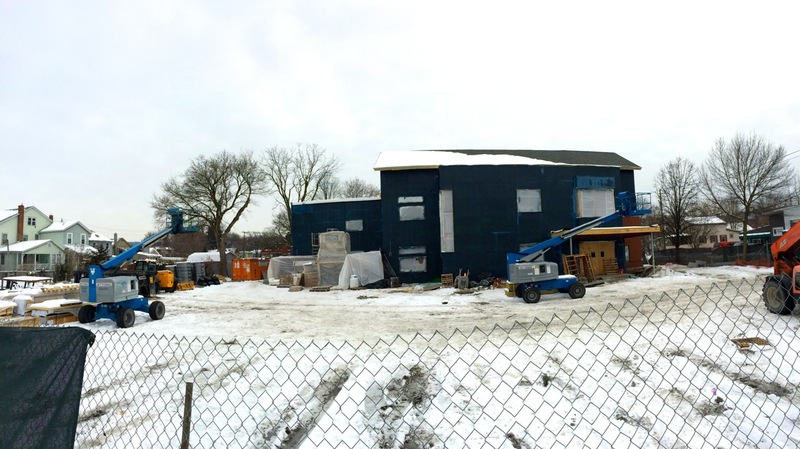 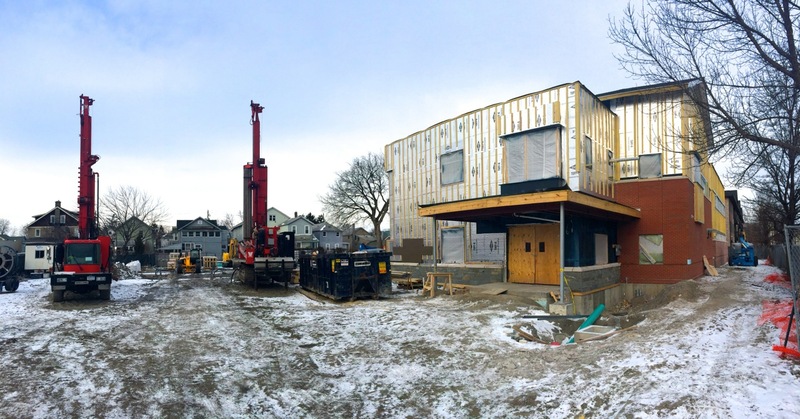 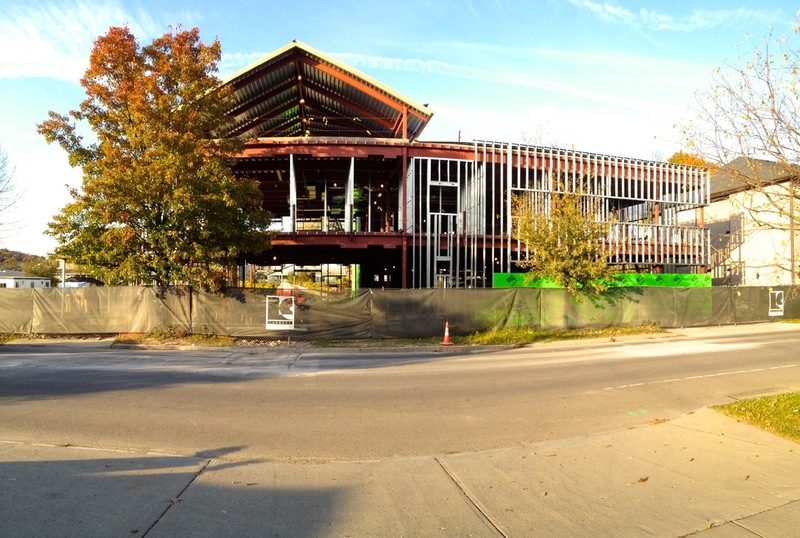 There’s more progress on exterior wall-framing, sheathing, and some new interior wall framing. 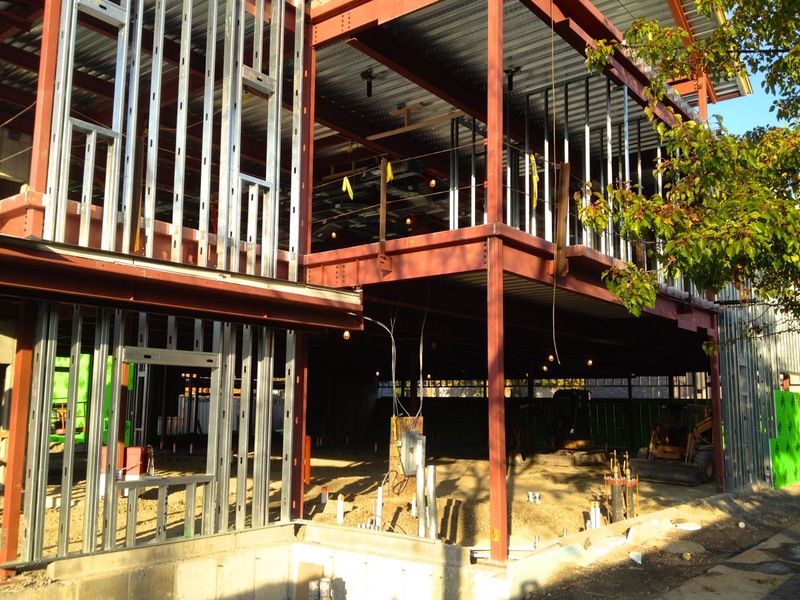 I can also see a bunch of new HVAC ductwork along the ceilings on the second level, an electrical panel with conduit runs for temporary lighting, and pipework on the ground level.